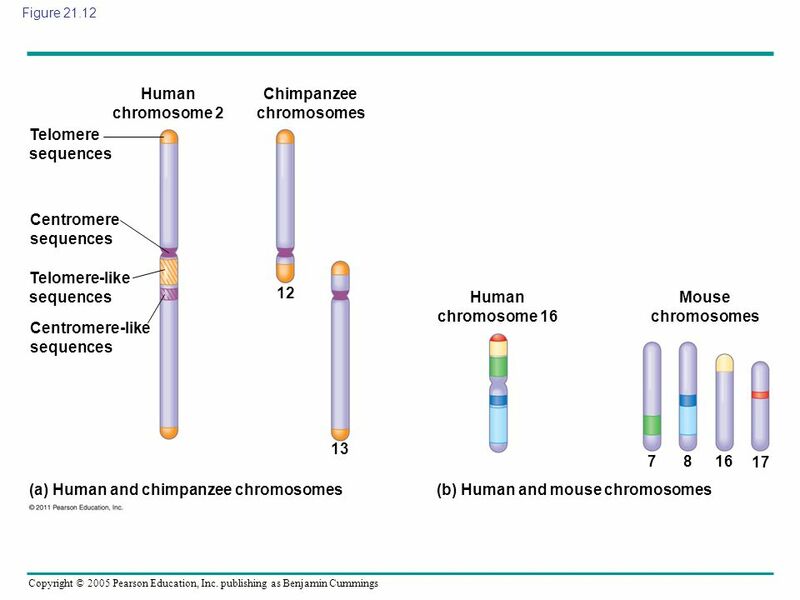 Figure 21.1 Chapter 21 Genomes and their Evolution Figure 21.1 What genomic information distinguishes a human from a chimpanzee? 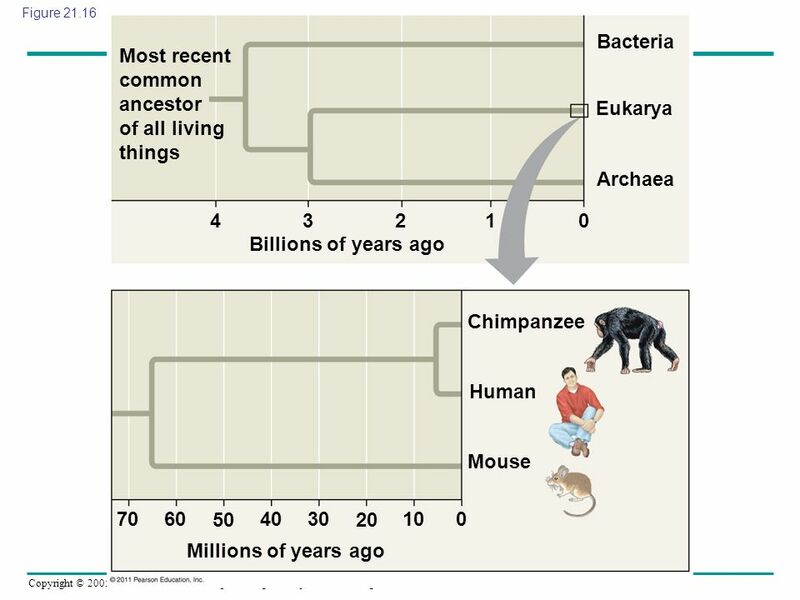 Genome sequences exist human, chimpanzee, E. coli, brewer’s yeast, corn, fruit fly, house mouse, rhesus macaque, ………. 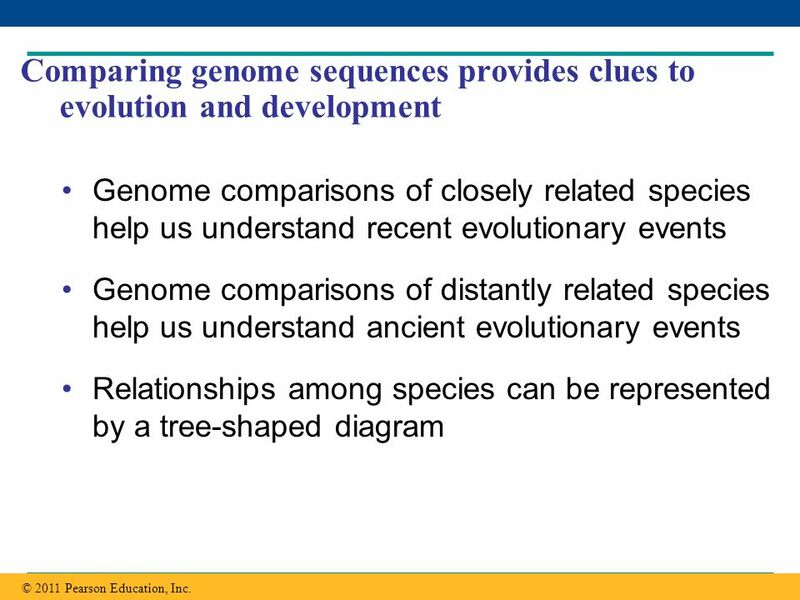 Provides information about the evolutionary history of genes and taxonomic groups © 2011 Pearson Education, Inc.
Bioinformatics is the application of computational methods to the storage and analysis of biological data © 2011 Pearson Education, Inc.
4 Genome Sequencing Human Genome Project began in 1990 largely completed by 2003 3 stages Genetic (or linkage) mapping Physical mapping DNA sequencing © 2011 Pearson Education, Inc.
Linkage Mapping  maps location of several thousand genetic markers on each chromosome genetic marker  gene or other identifiable DNA sequence Recombination frequencies used to determine the order & relative distances between genetic markers © 2011 Pearson Education, Inc. 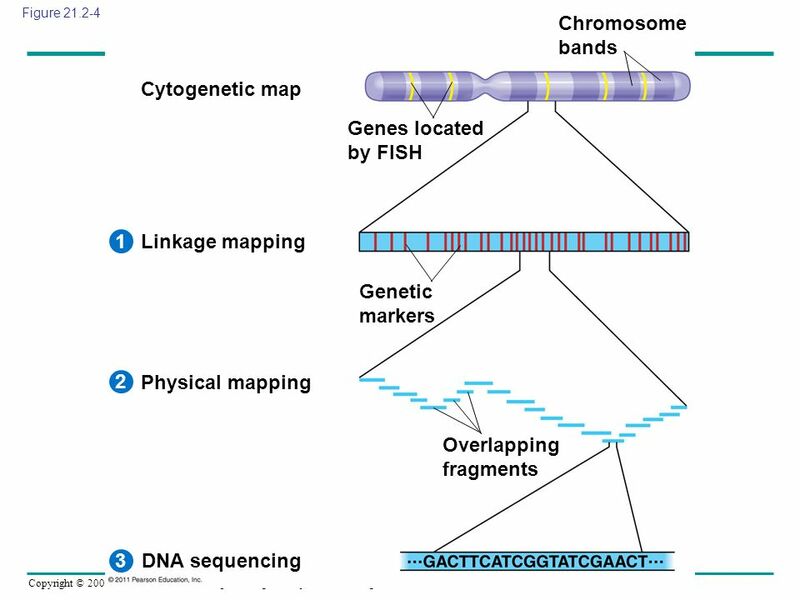 Figure 21.2 Three-stage approach to sequencing an entire genome. 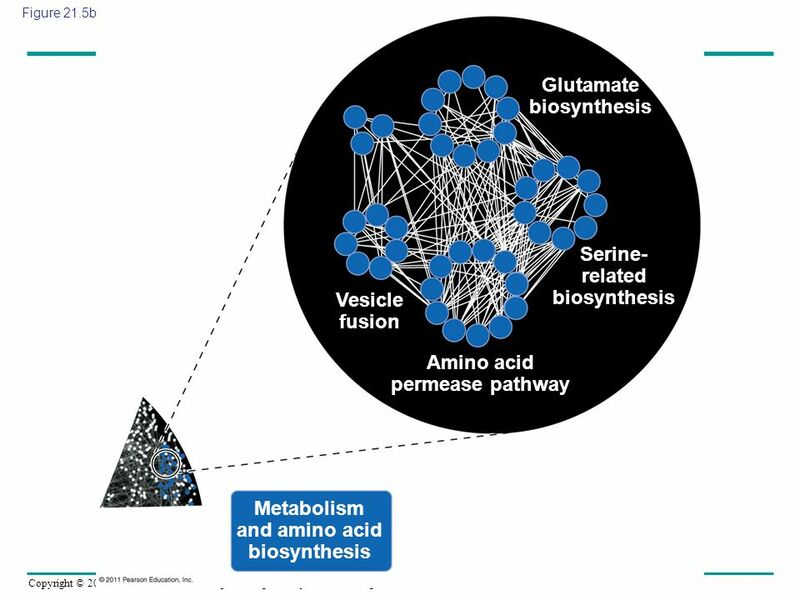 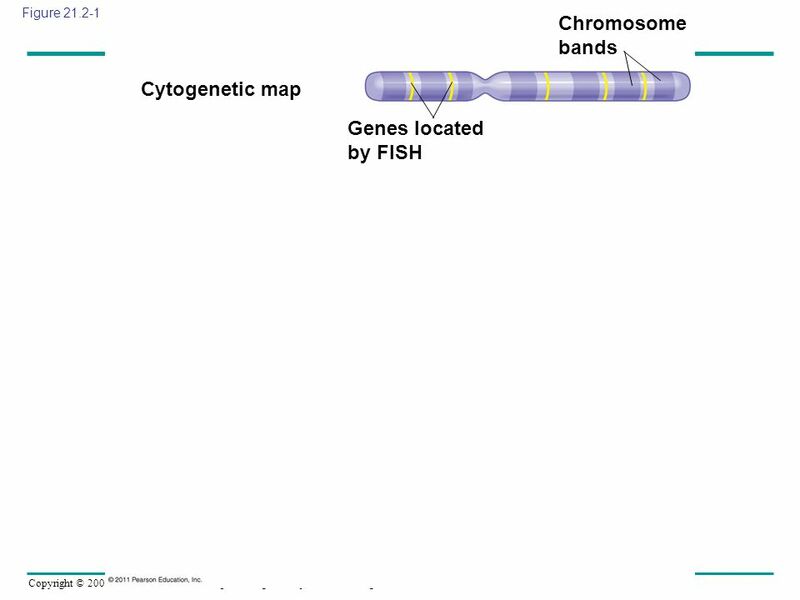 Figure Chromosome bands Cytogenetic map Genes located by FISH 1 Linkage mapping Genetic markers Figure 21.2 Three-stage approach to sequencing an entire genome. 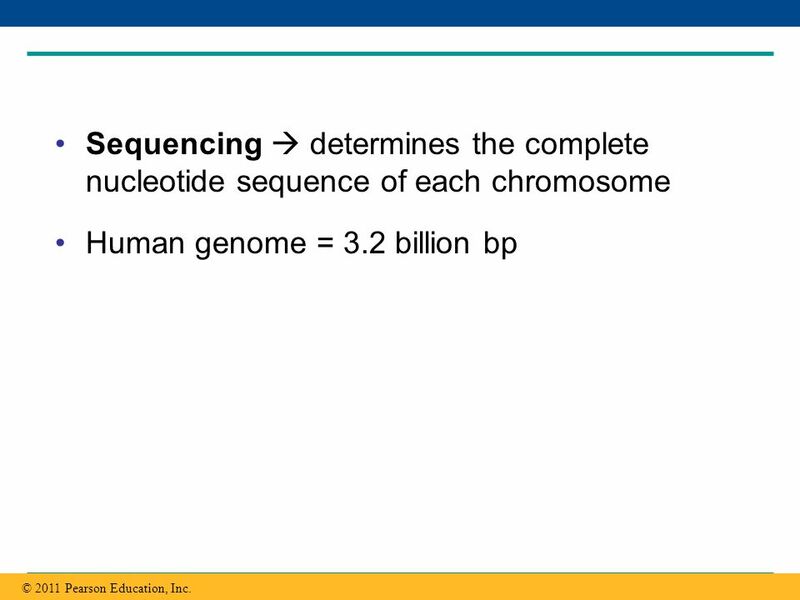 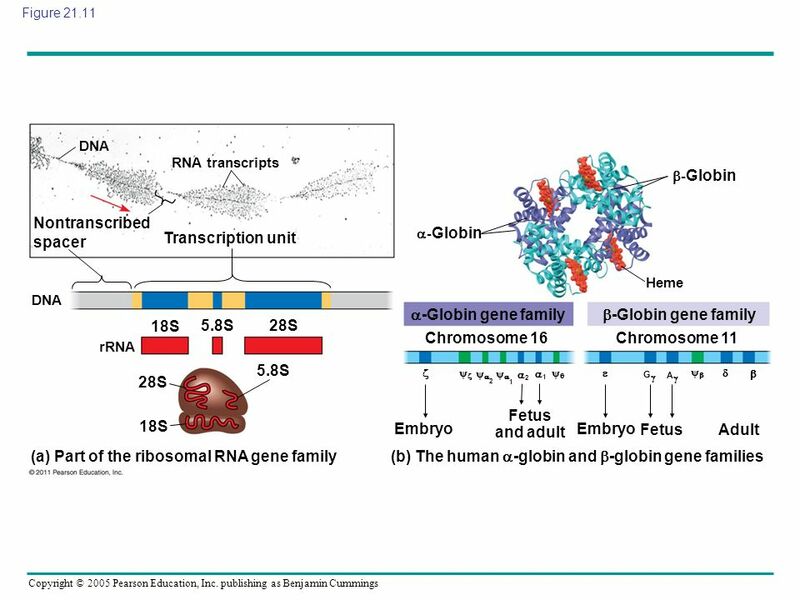 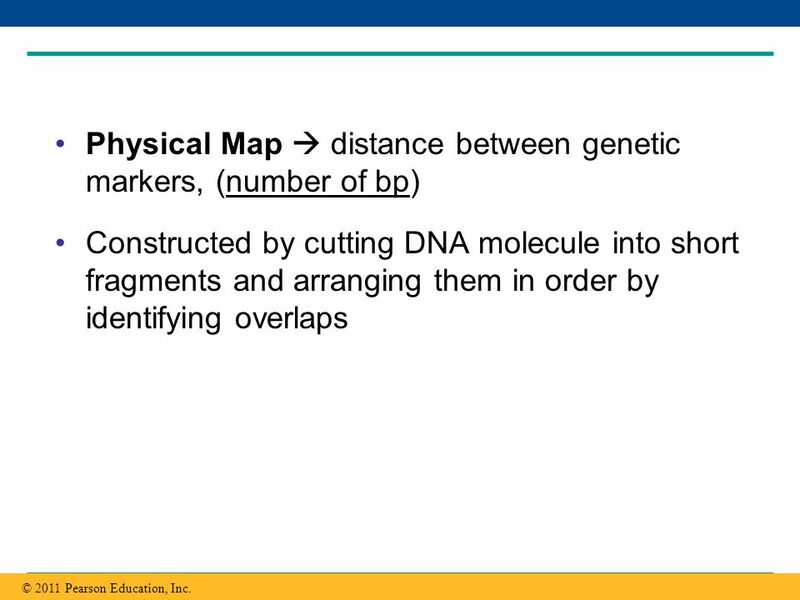 Constructed by cutting DNA molecule into short fragments and arranging them in order by identifying overlaps © 2011 Pearson Education, Inc.
Sequencing  determines the complete nucleotide sequence of each chromosome Human genome = 3.2 billion bp © 2011 Pearson Education, Inc. 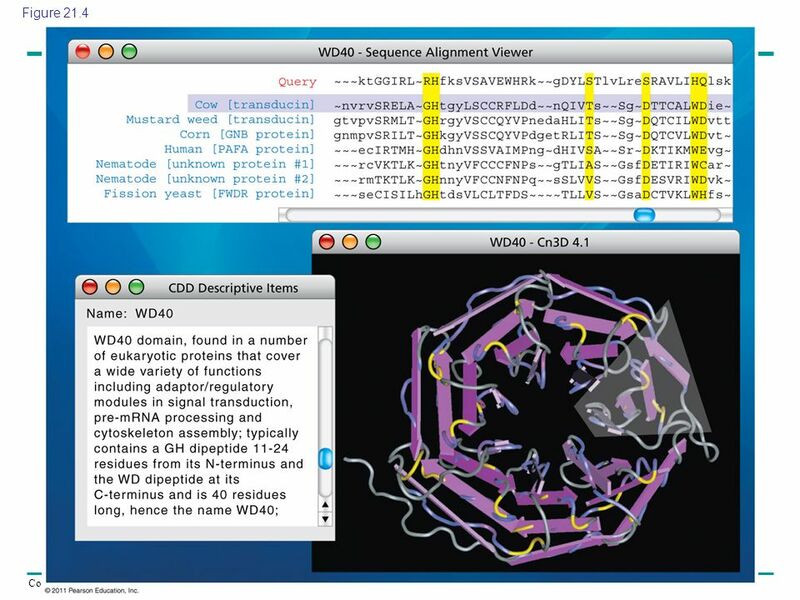 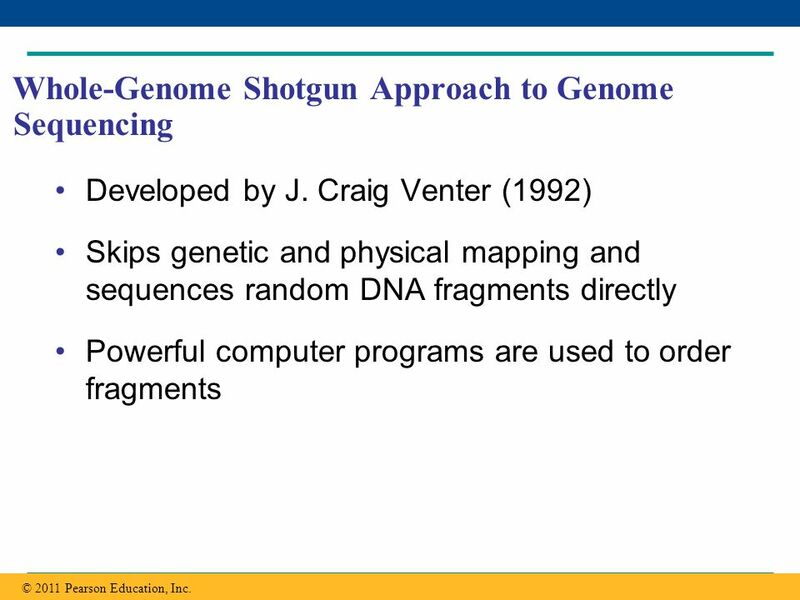 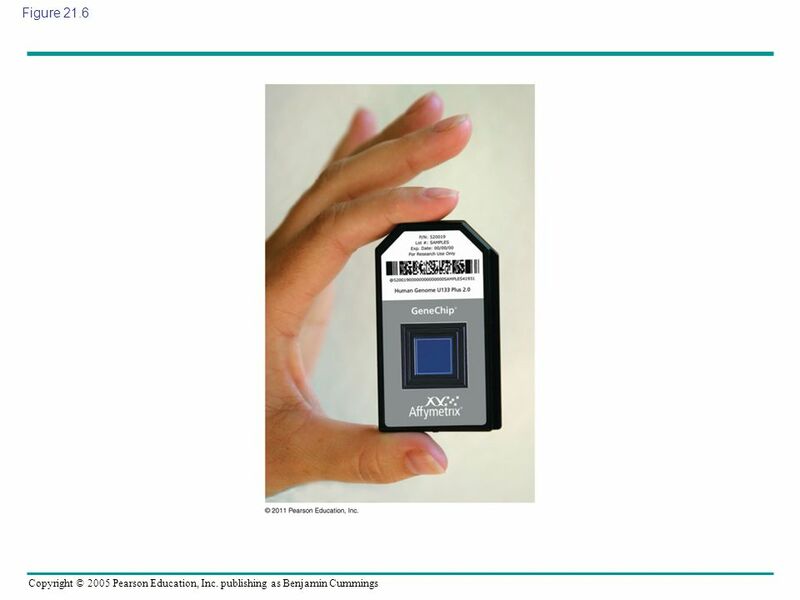 Developed by J. Craig Venter (1992) Skips genetic and physical mapping and sequences random DNA fragments directly Powerful computer programs are used to order fragments © 2011 Pearson Education, Inc.
13 Cut the DNA into overlapping frag- ments short enough for sequencing. 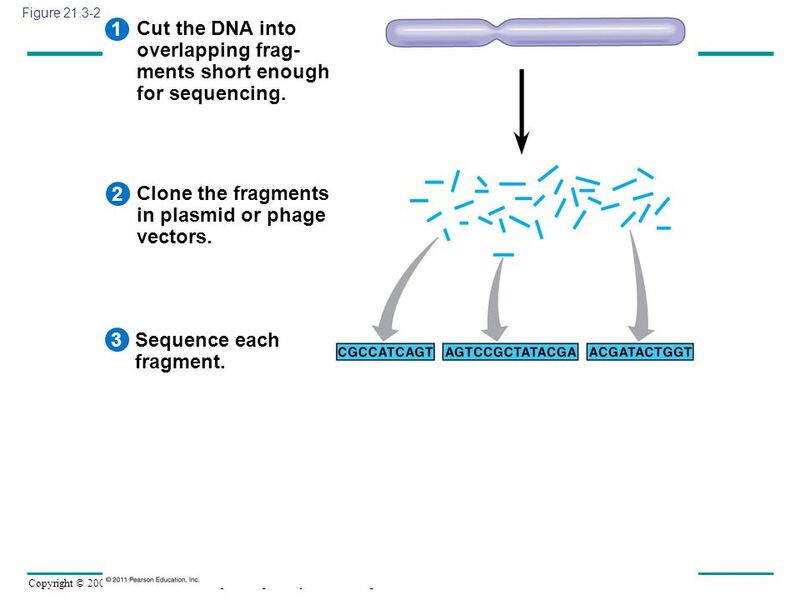 Figure 1 Cut the DNA into overlapping frag- ments short enough for sequencing. 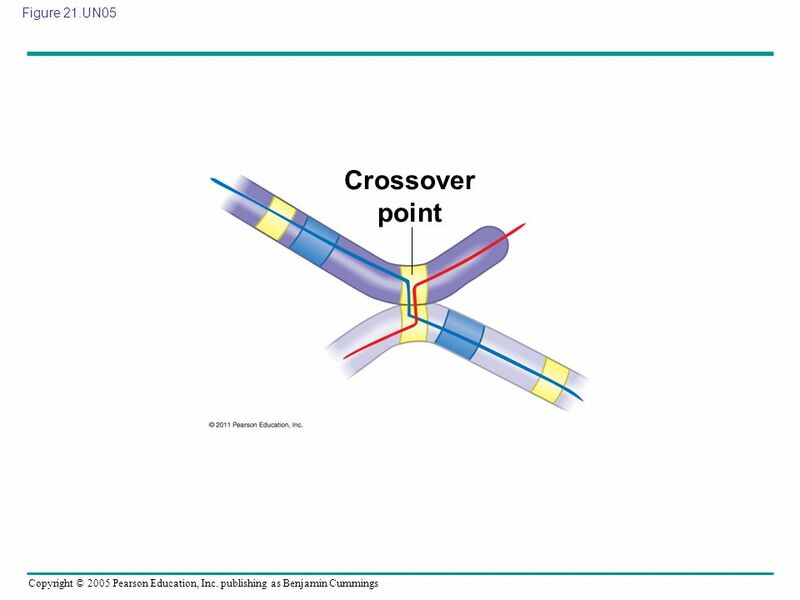 2 Clone the fragments in plasmid or phage vectors. 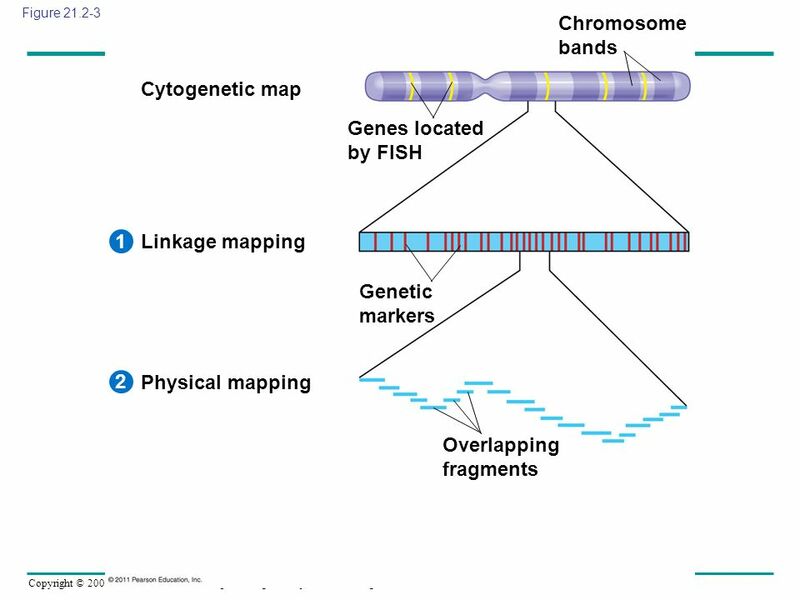 Figure 21.3 Whole-genome shotgun approach to sequencing. 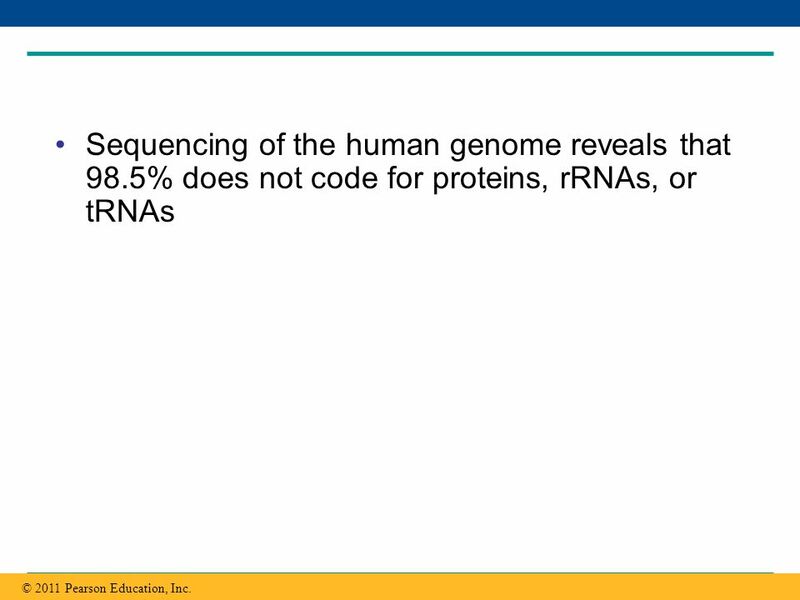 14 Cut the DNA into overlapping frag- ments short enough for sequencing. 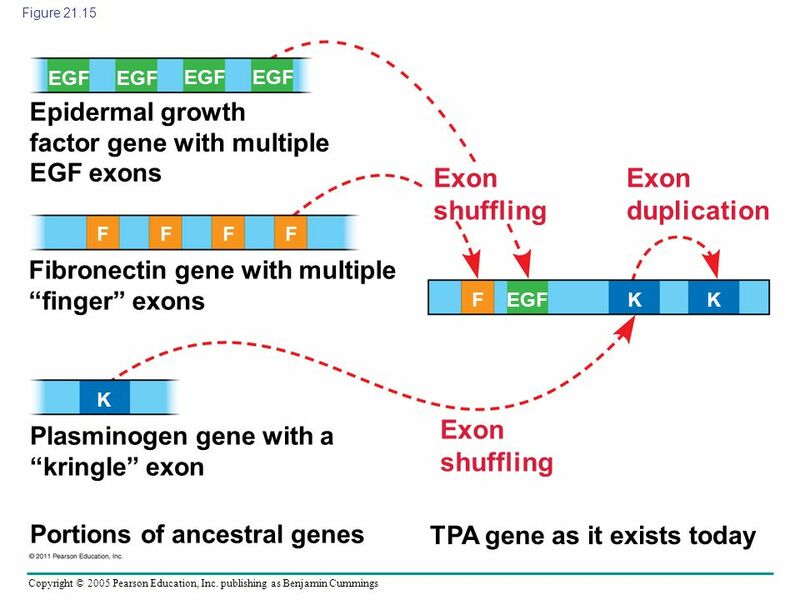 Figure 1 Cut the DNA into overlapping frag- ments short enough for sequencing. 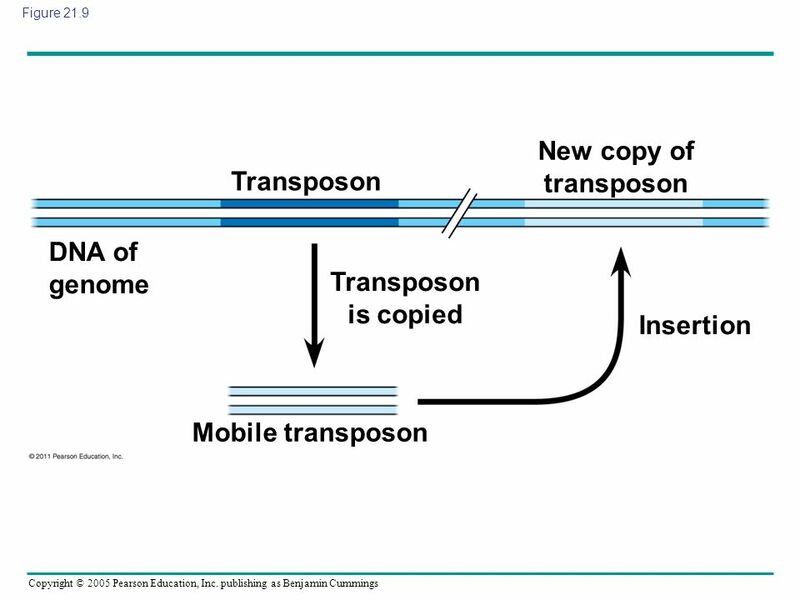 2 Clone the fragments in plasmid or phage vectors. 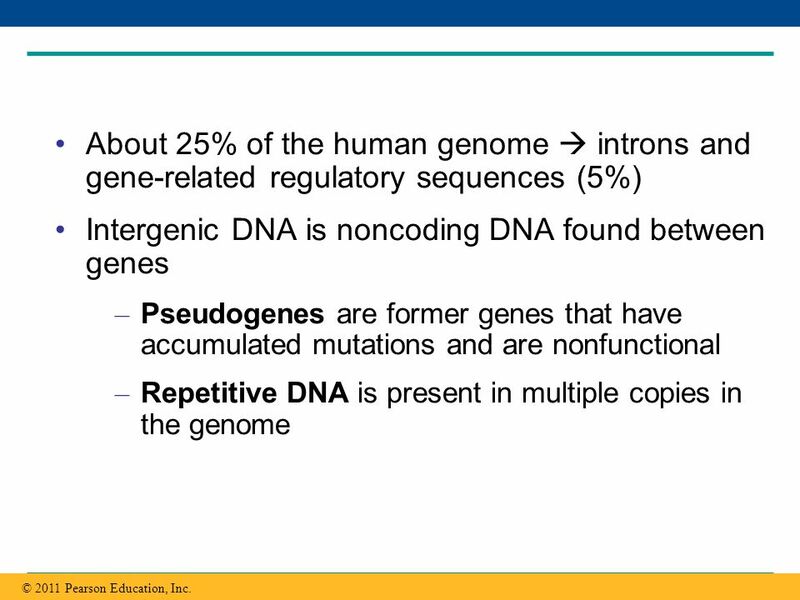 3 Sequence each fragment. 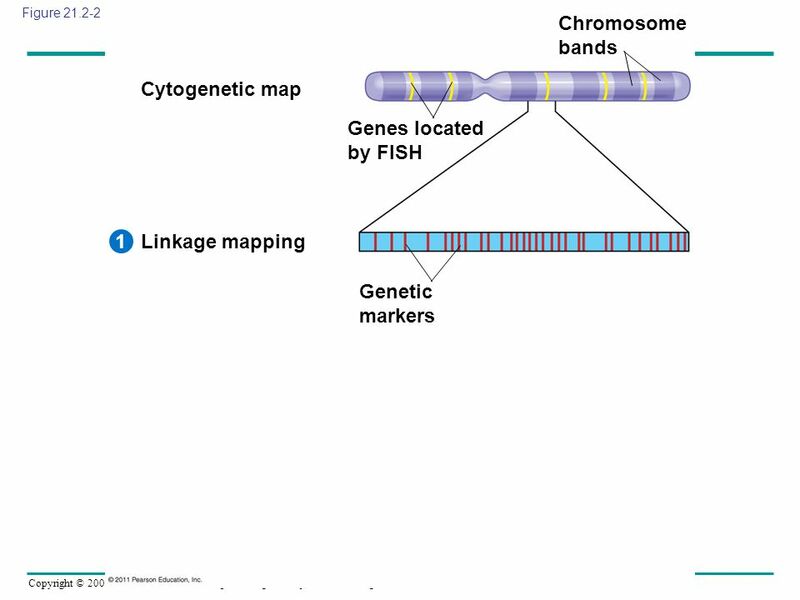 Figure 21.3 Whole-genome shotgun approach to sequencing. 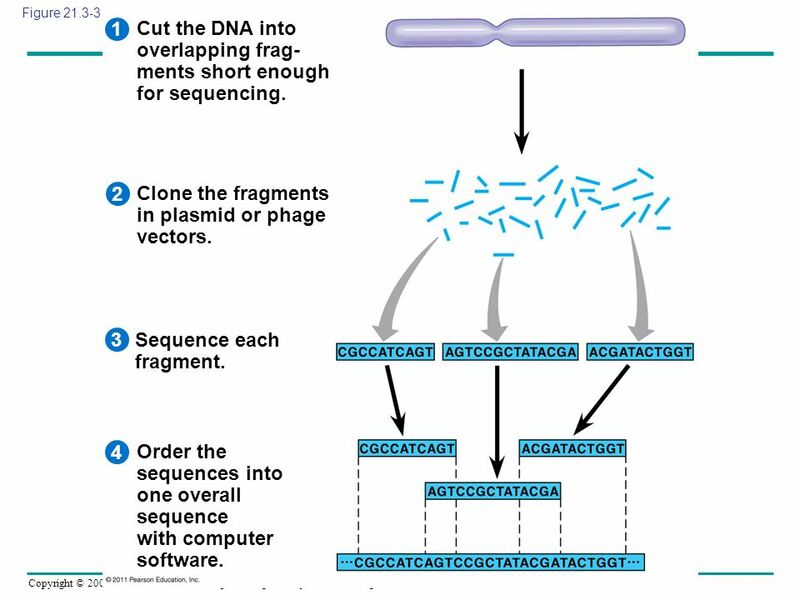 15 Cut the DNA into overlapping frag- ments short enough for sequencing. 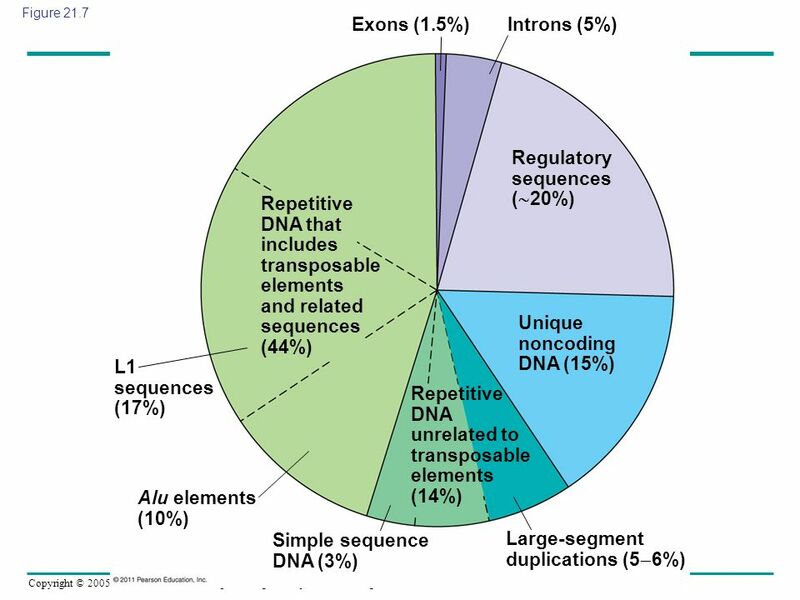 Figure 1 Cut the DNA into overlapping frag- ments short enough for sequencing. 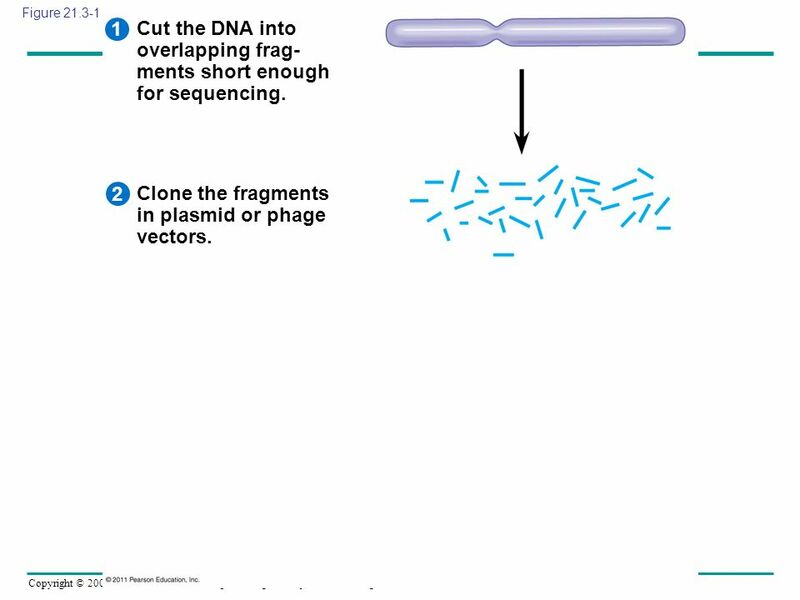 2 Clone the fragments in plasmid or phage vectors. 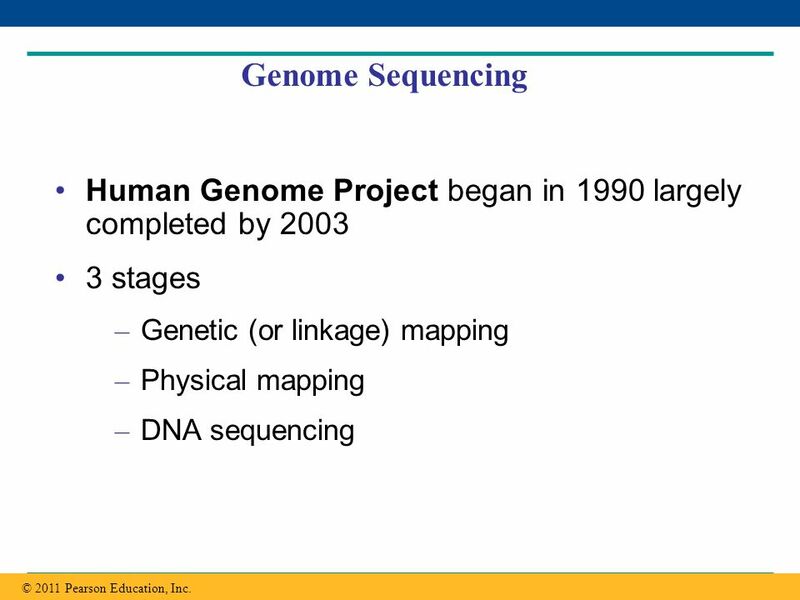 3 Sequence each fragment. 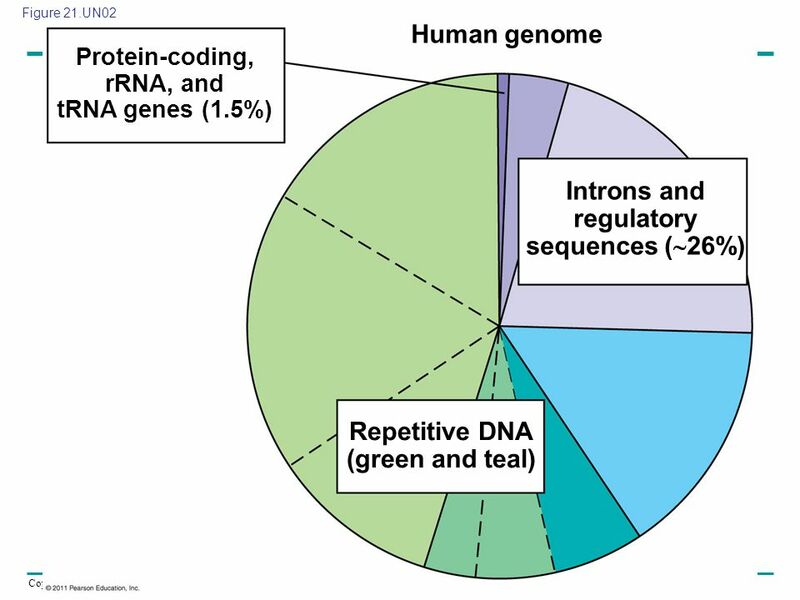 Figure 21.3 Whole-genome shotgun approach to sequencing. 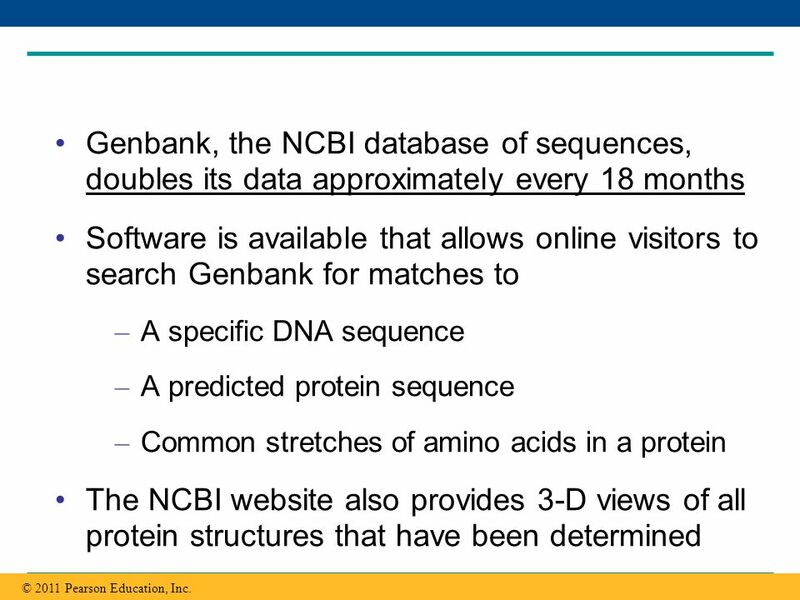 4 Order the sequences into one overall sequence with computer software. 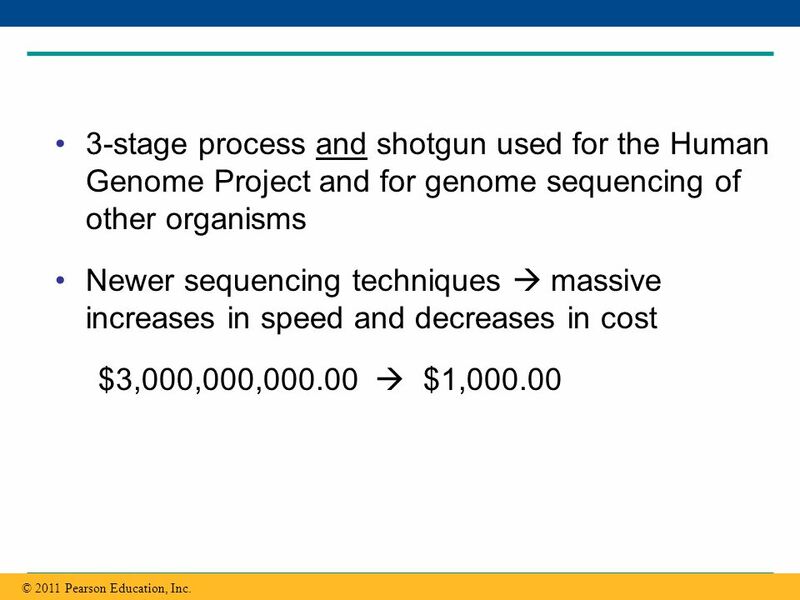 16 3-stage process and shotgun used for the Human Genome Project and for genome sequencing of other organisms Newer sequencing techniques  massive increases in speed and decreases in cost $3,000,000,  $1,000.00 © 2011 Pearson Education, Inc. 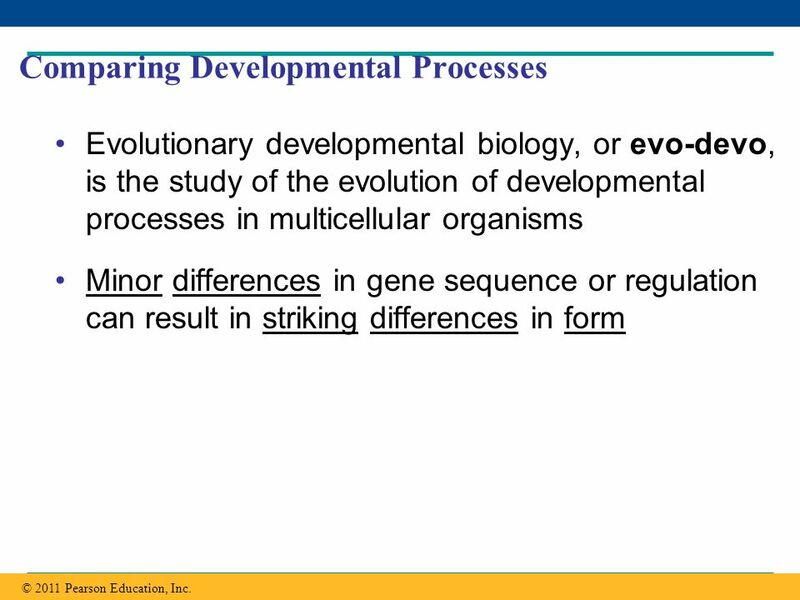 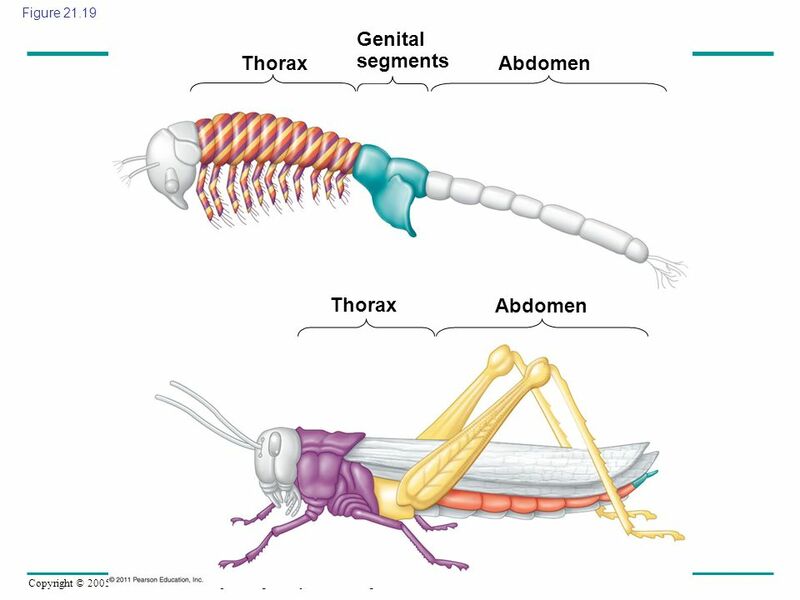 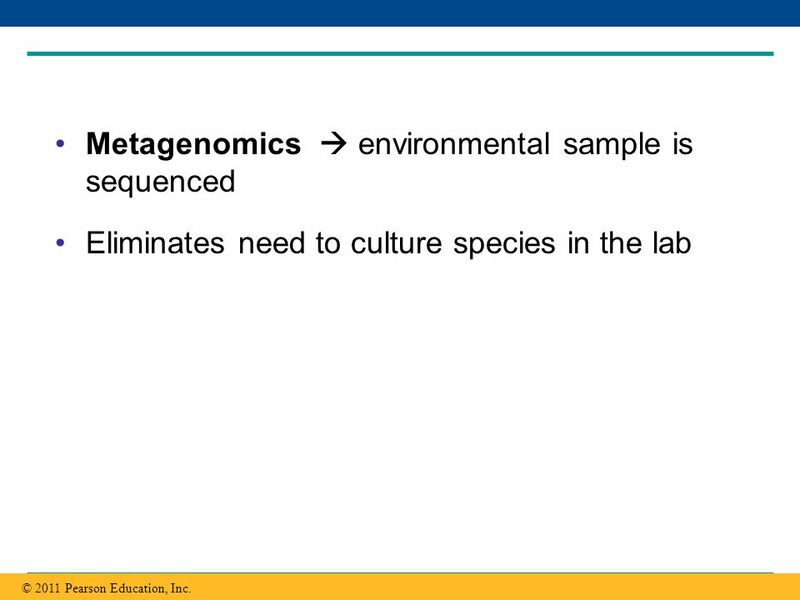 Eliminates need to culture species in the lab © 2011 Pearson Education, Inc. 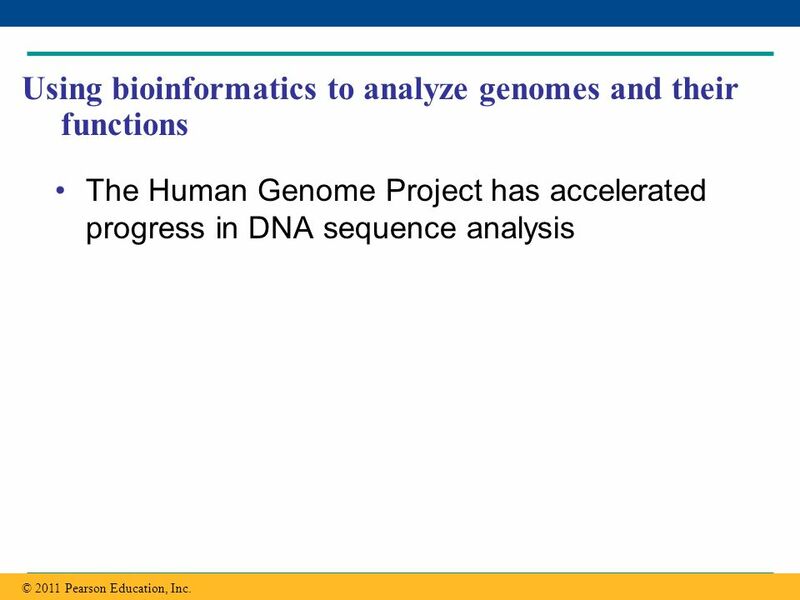 The Human Genome Project has accelerated progress in DNA sequence analysis © 2011 Pearson Education, Inc.
National Library of Medicine and the National Institutes of Health (NIH) created the National Center for Biotechnology Information (NCBI) BGI in Shenzhen, China European Molecular Biology Laboratory DNA Data Bank of Japan © 2011 Pearson Education, Inc.
Software is available that allows online visitors to search Genbank for matches to A specific DNA sequence A predicted protein sequence Common stretches of amino acids in a protein The NCBI website also provides 3-D views of all protein structures that have been determined © 2011 Pearson Education, Inc.
21 Figure 21.4 Figure 21.4 Bioinformatics tools available on the Internet. 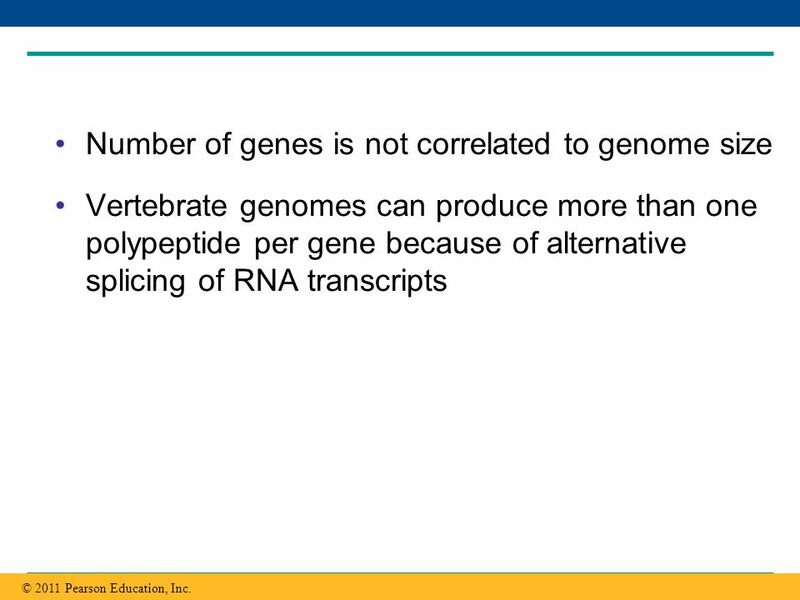 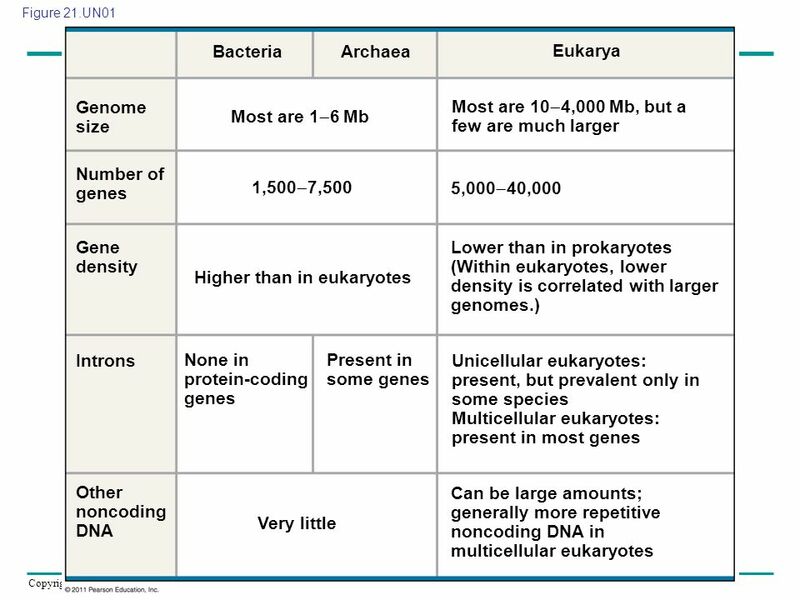 Comparison of unknown genes to known genes in other species provides clues about function © 2011 Pearson Education, Inc. 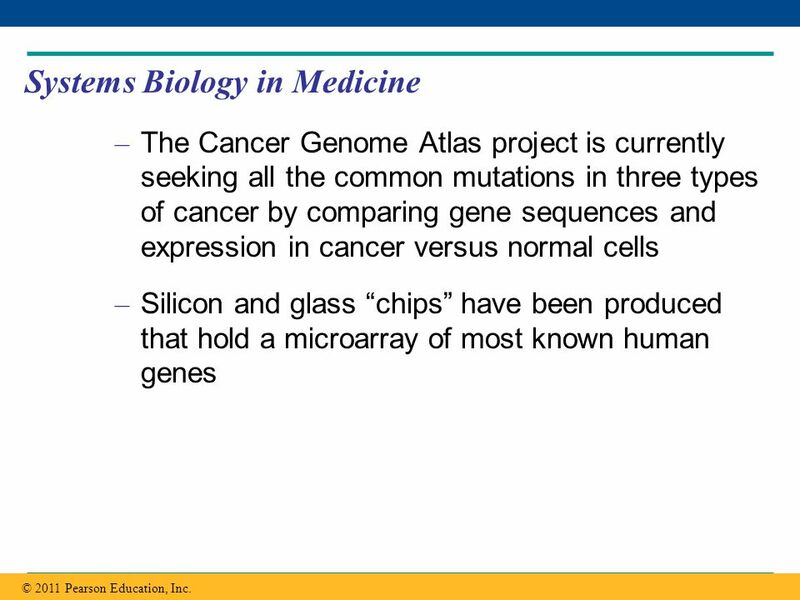 The Cancer Genome Atlas project is currently seeking all the common mutations in three types of cancer by comparing gene sequences and expression in cancer versus normal cells Silicon and glass “chips” have been produced that hold a microarray of most known human genes © 2011 Pearson Education, Inc.
28 Figure 21.6 Figure 21.6 A human gene microarray chip. 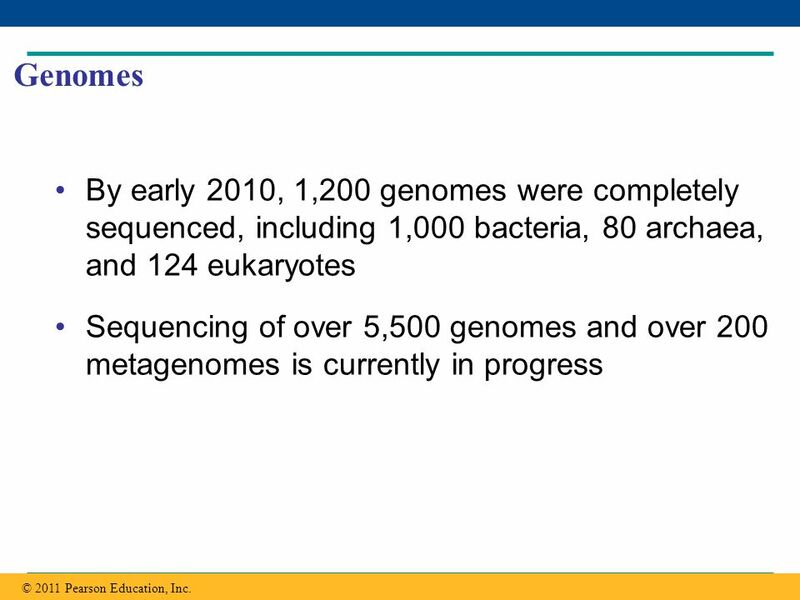 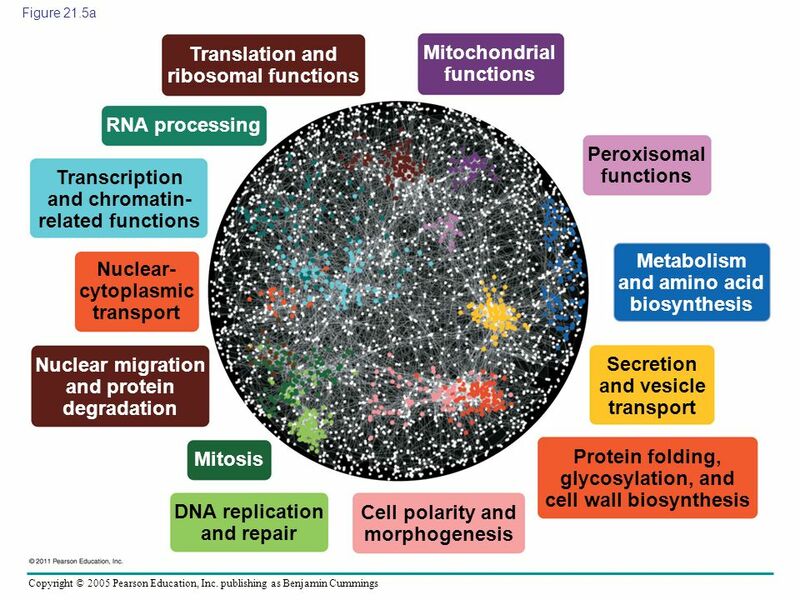 29 Genomes By early 2010, 1,200 genomes were completely sequenced, including 1,000 bacteria, 80 archaea, and 124 eukaryotes Sequencing of over 5,500 genomes and over 200 metagenomes is currently in progress © 2011 Pearson Education, Inc.
Plant & animal  greater than 100 Mb; humans  3,000 Mb Within each domain there is no systematic relationship between genome size and phenotype © 2011 Pearson Education, Inc.
Eukaryotes from 40,000 genes © 2011 Pearson Education, Inc.
Vertebrate genomes can produce more than one polypeptide per gene because of alternative splicing of RNA transcripts © 2011 Pearson Education, Inc. 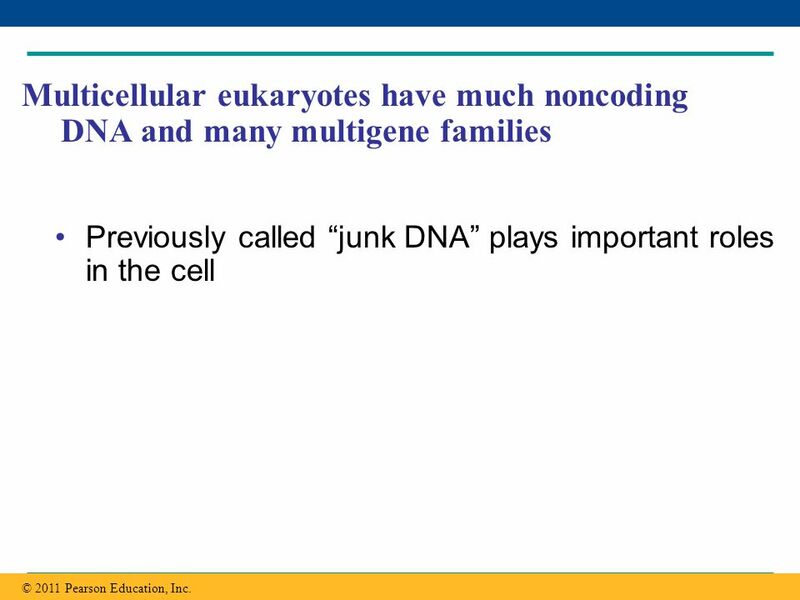 Previously called “junk DNA” plays important roles in the cell © 2011 Pearson Education, Inc.
Sequencing of the human genome reveals that 98.5% does not code for proteins, rRNAs, or tRNAs © 2011 Pearson Education, Inc.
About 25% of the human genome  introns and gene-related regulatory sequences (5%) Intergenic DNA is noncoding DNA found between genes Pseudogenes are former genes that have accumulated mutations and are nonfunctional Repetitive DNA is present in multiple copies in the genome © 2011 Pearson Education, Inc.
First evidence came from geneticist Barbara McClintock’s breeding experiments with Indian corn Identified changes in the color of kernels that made sense only by mobile genetic elements Present in both prokaryotes and eukaryotes © 2011 Pearson Education, Inc.
40 Figure 21.8 Figure 21.8 The effect of transposable elements on corn kernel color. 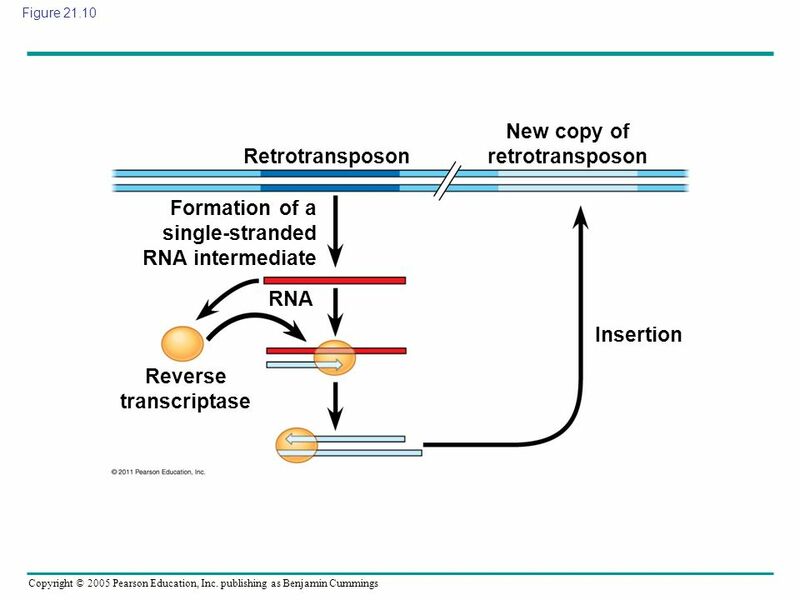 Figure 21.10 New copy of retrotransposon Retrotransposon Formation of a single-stranded RNA intermediate RNA Insertion Reverse transcriptase Figure Retrotransposon movement. 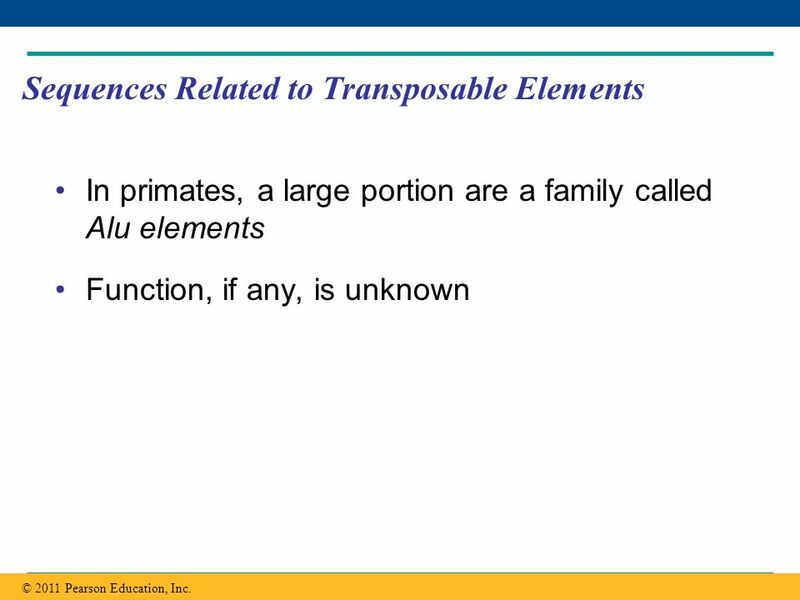 In primates, a large portion are a family called Alu elements Function, if any, is unknown © 2011 Pearson Education, Inc. 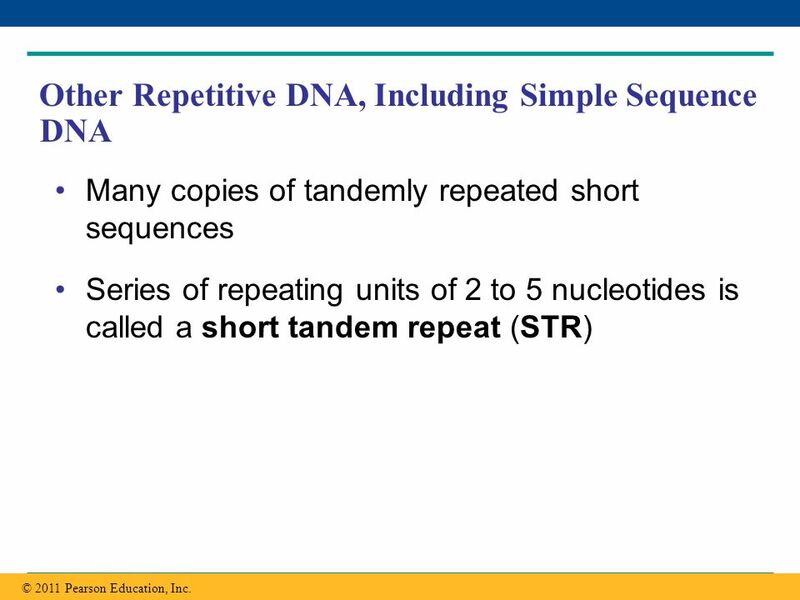 Many copies of tandemly repeated short sequences Series of repeating units of 2 to 5 nucleotides is called a short tandem repeat (STR) © 2011 Pearson Education, Inc. 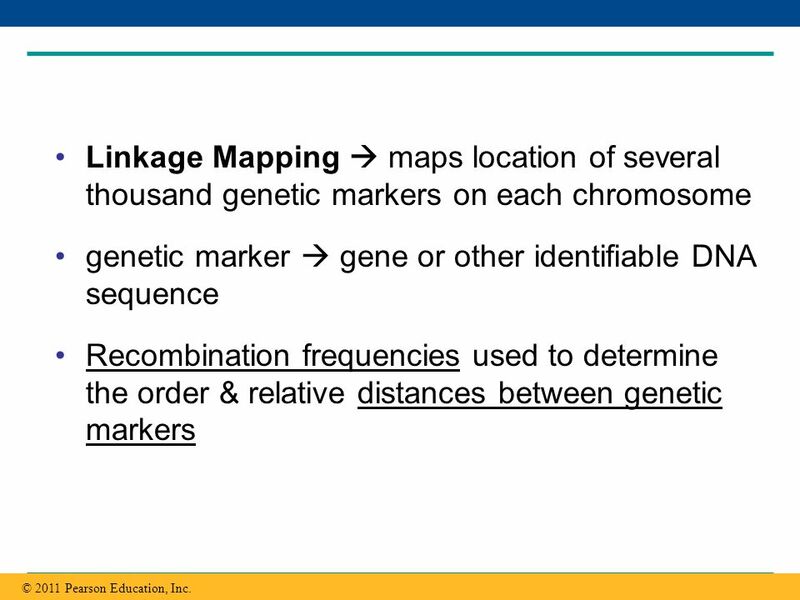 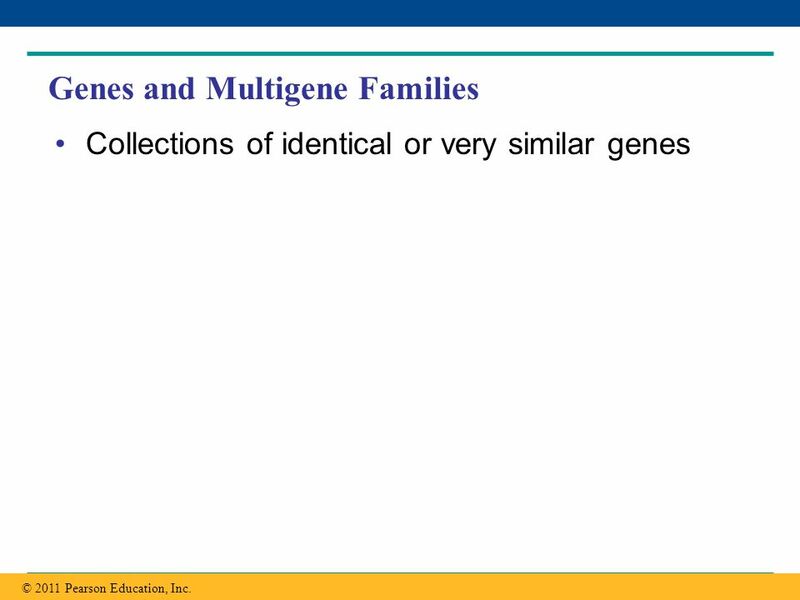 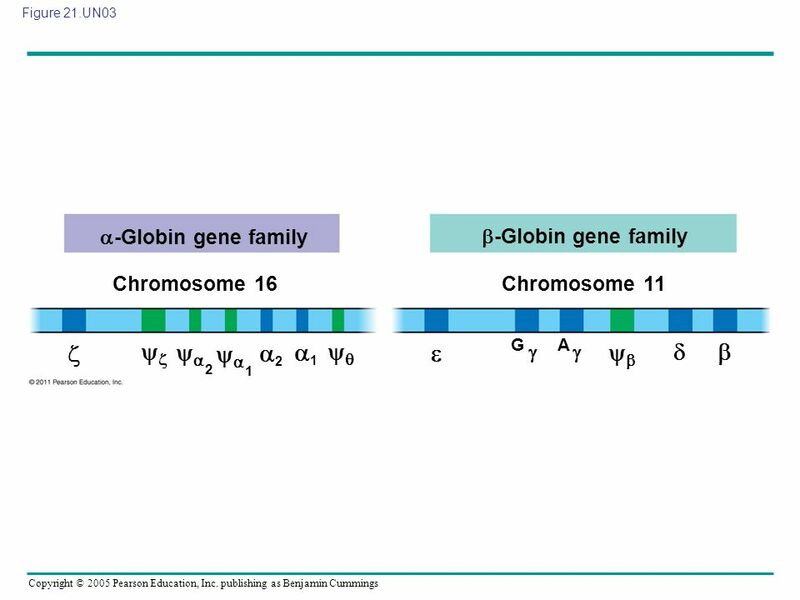 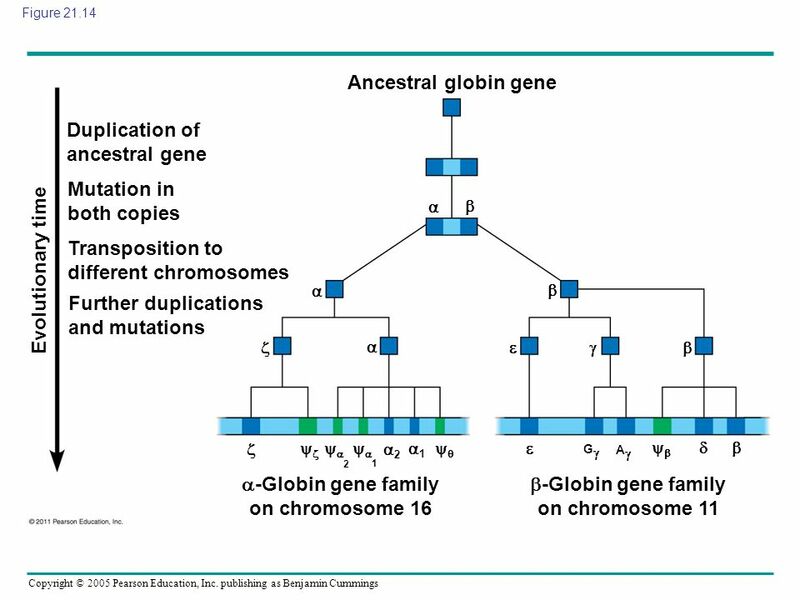 Collections of identical or very similar genes © 2011 Pearson Education, Inc. 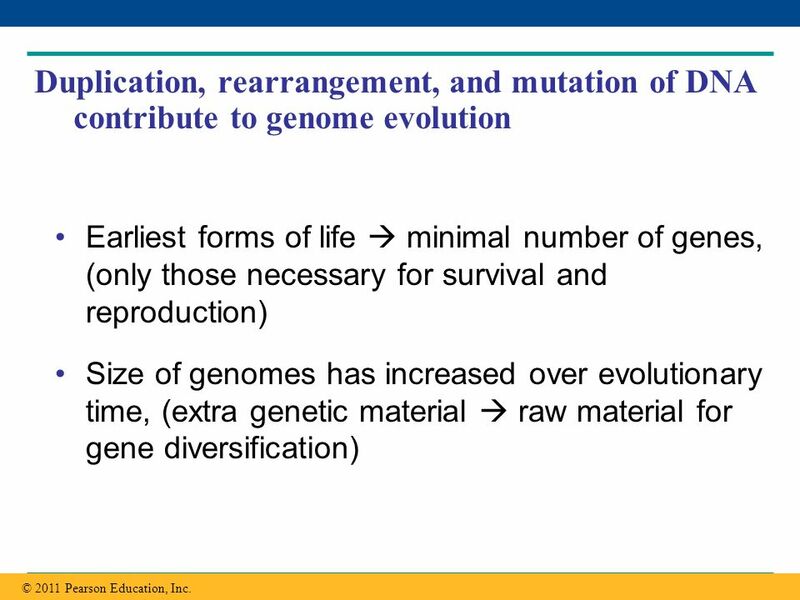 Earliest forms of life  minimal number of genes, (only those necessary for survival and reproduction) Size of genomes has increased over evolutionary time, (extra genetic material  raw material for gene diversification) © 2011 Pearson Education, Inc. 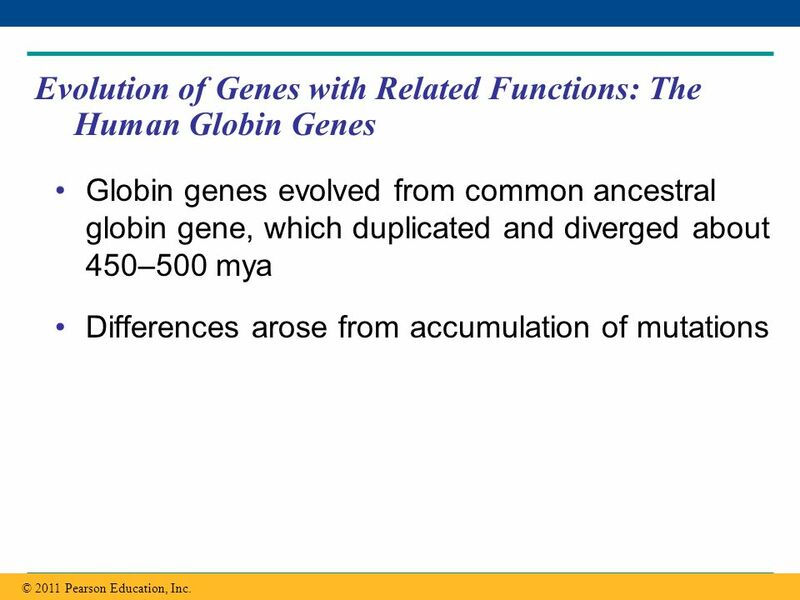 Humans have 23 pairs of chromosomes, while chimpanzees have 24 pairs 2 ancestral chromosomes fused in the human line © 2011 Pearson Education, Inc.
Globin genes evolved from common ancestral globin gene, which duplicated and diverged about 450–500 mya Differences arose from accumulation of mutations © 2011 Pearson Education, Inc. 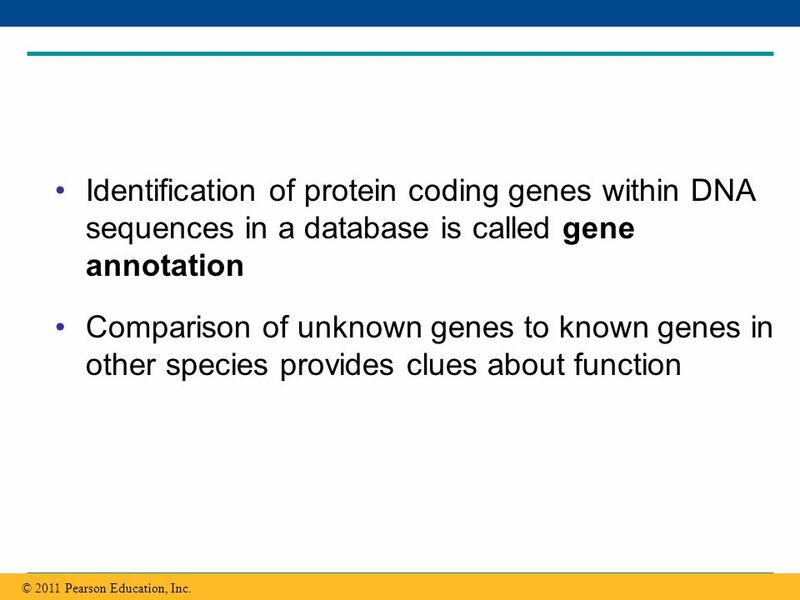 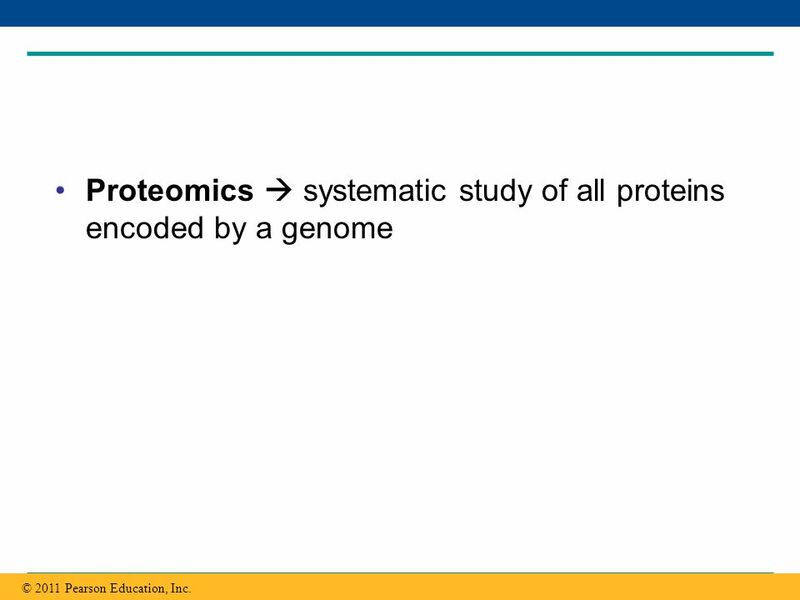 Some duplicated genes have diverged so much that the functions of encoded proteins are now very different e.g. 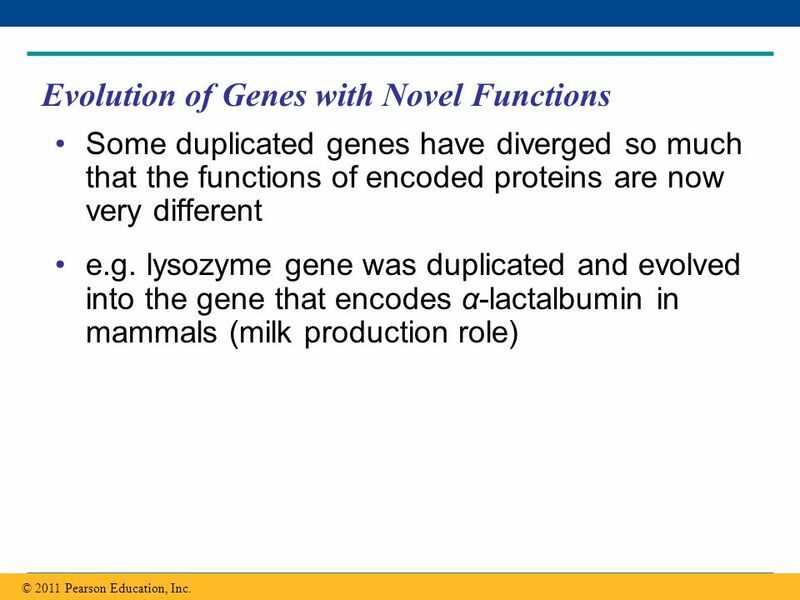 lysozyme gene was duplicated and evolved into the gene that encodes α-lactalbumin in mammals (milk production role) © 2011 Pearson Education, Inc.
Has contributed to genome evolution Mixing and matching of exons © 2011 Pearson Education, Inc. 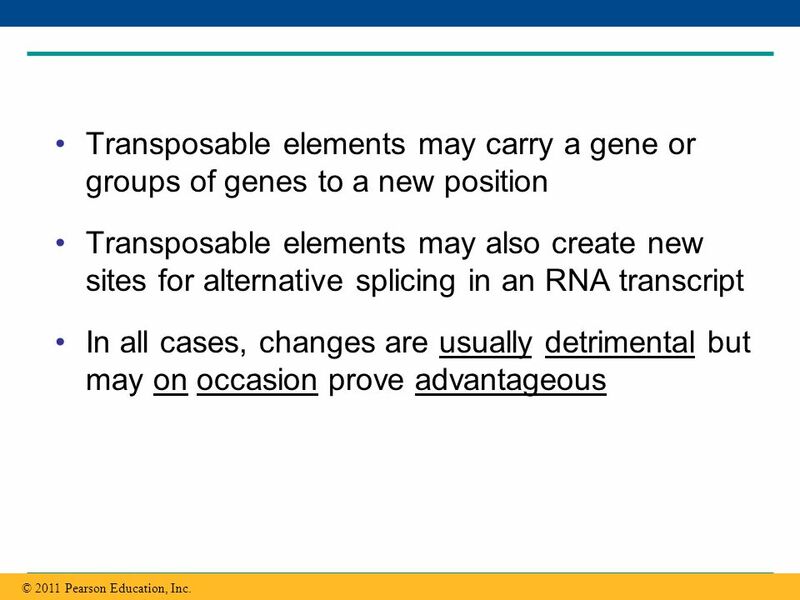 Multiple copies of similar transposable elements may facilitate recombination, or crossing over, between different chromosomes Insertion of transposable elements within a protein-coding sequence may block protein production Insertion of transposable elements within a regulatory sequence may increase or decrease protein production © 2011 Pearson Education, Inc.
Transposable elements may also create new sites for alternative splicing in an RNA transcript In all cases, changes are usually detrimental but may on occasion prove advantageous © 2011 Pearson Education, Inc.
Genome comparisons of closely related species help us understand recent evolutionary events Genome comparisons of distantly related species help us understand ancient evolutionary events Relationships among species can be represented by a tree-shaped diagram © 2011 Pearson Education, Inc. 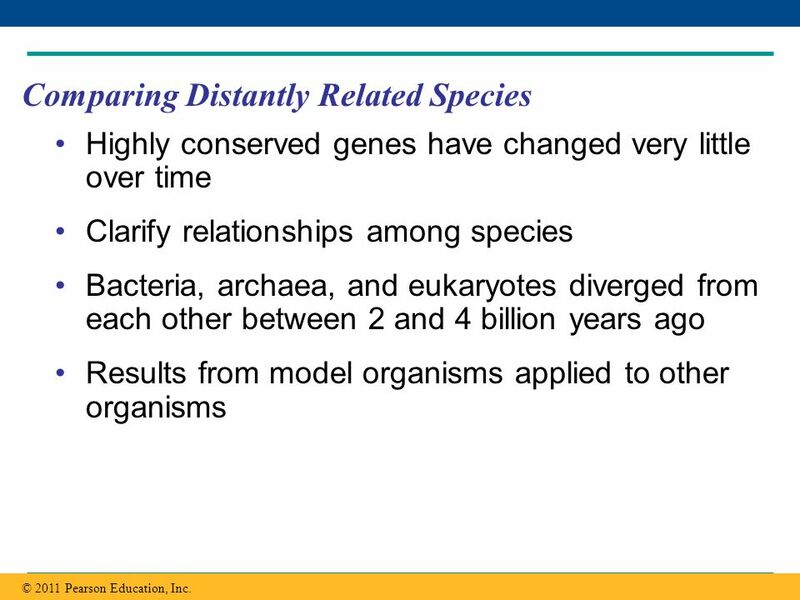 Highly conserved genes have changed very little over time Clarify relationships among species Bacteria, archaea, and eukaryotes diverged from each other between 2 and 4 billion years ago Results from model organisms applied to other organisms © 2011 Pearson Education, Inc.
Human and chimpanzee genomes differ by 1.2%, at single base-pairs, and by 2.7% because of insertions and deletions Several genes are evolving faster in humans than chimpanzees These include genes involved in defense against malaria and tuberculosis, regulation of brain size, and genes that code for transcription factors © 2011 Pearson Education, Inc. 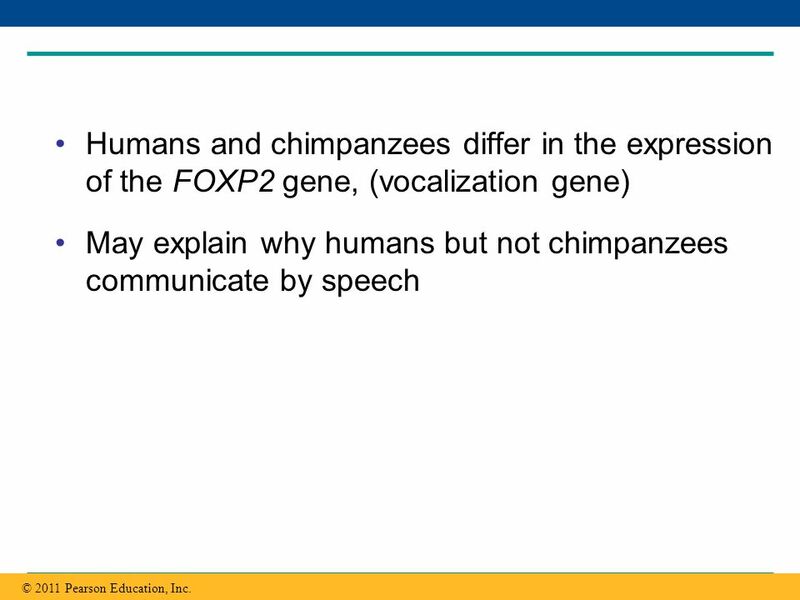 Humans and chimpanzees differ in the expression of the FOXP2 gene, (vocalization gene) May explain why humans but not chimpanzees communicate by speech © 2011 Pearson Education, Inc.
Human species only 200,000 years old  low within-species genetic variation Variation due to single nucleotide polymorphisms, inversions, deletions, and duplications Variations useful for studying human evolution and human health © 2011 Pearson Education, Inc. 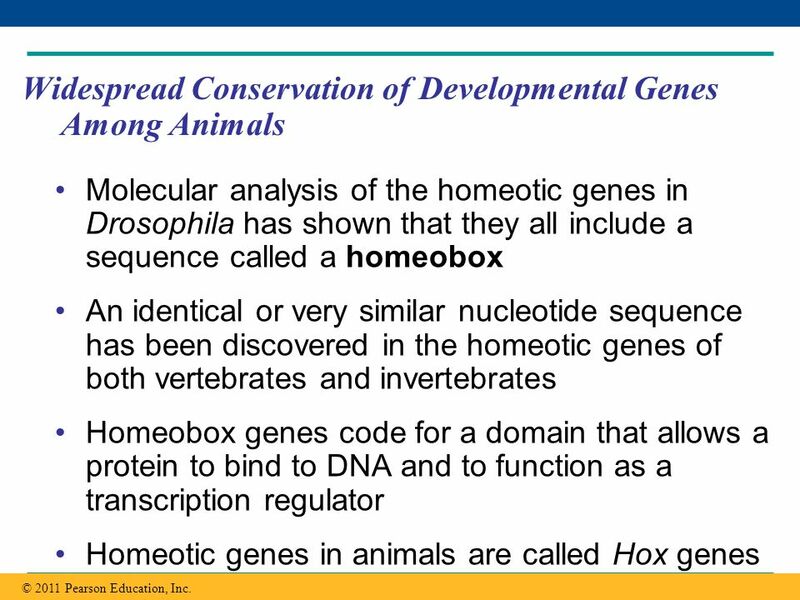 Evolutionary developmental biology, or evo-devo, is the study of the evolution of developmental processes in multicellular organisms Minor differences in gene sequence or regulation can result in striking differences in form © 2011 Pearson Education, Inc.
Molecular analysis of the homeotic genes in Drosophila has shown that they all include a sequence called a homeobox An identical or very similar nucleotide sequence has been discovered in the homeotic genes of both vertebrates and invertebrates Homeobox genes code for a domain that allows a protein to bind to DNA and to function as a transcription regulator Homeotic genes in animals are called Hox genes © 2011 Pearson Education, Inc.
68 Related homeobox sequences have been found in regulatory genes of yeasts, plants, and even prokaryotes In addition to homeotic genes, many other developmental genes are highly conserved from species to species © 2011 Pearson Education, Inc.
For example, variation in Hox gene expression controls variation in leg-bearing segments of crustaceans and insects In other cases, genes with conserved sequences play different roles in different species © 2011 Pearson Education, Inc. 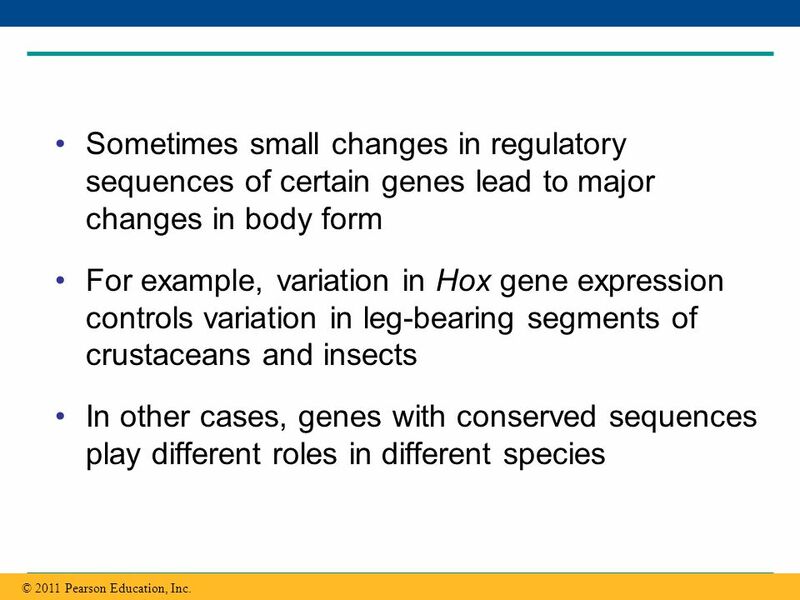 Figure Effect of differences in Hox gene expression in crustaceans and insects. 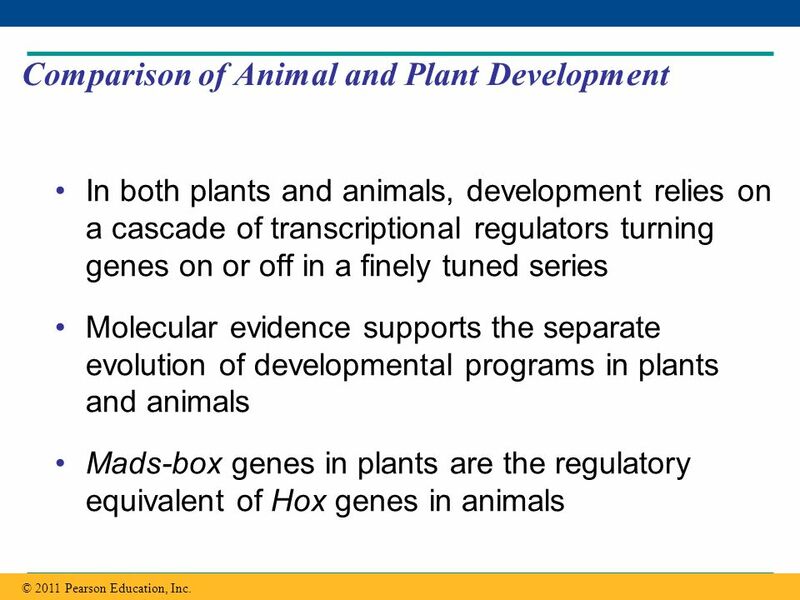 In both plants and animals, development relies on a cascade of transcriptional regulators turning genes on or off in a finely tuned series Molecular evidence supports the separate evolution of developmental programs in plants and animals Mads-box genes in plants are the regulatory equivalent of Hox genes in animals © 2011 Pearson Education, Inc.
Download ppt "Genomes and their Evolution"
The Organization of Cellular Genomes Complexity of Genomes Chromosomes and Chromatin Sequences of Genomes Bioinformatics As we have discussed for the last. 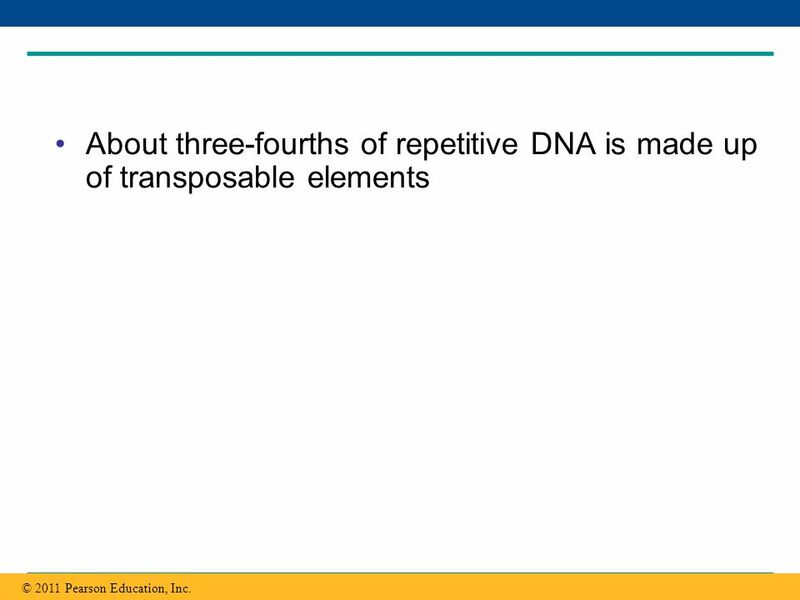 Describe the structure of a nucleosome, the basic unit of DNA packaging in eukaryotic cells. 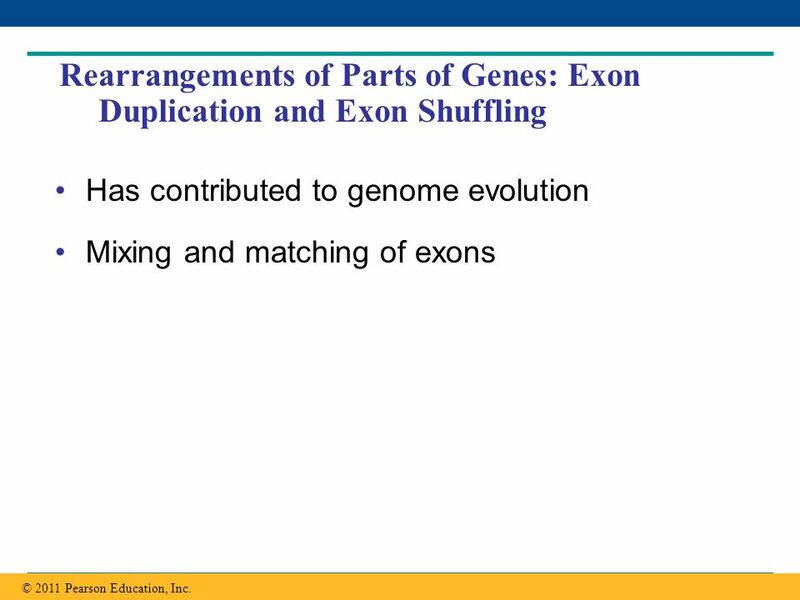 Duplication, rearrangement, and mutation of DNA contribute to genome evolution Chapter 21, Section 5. 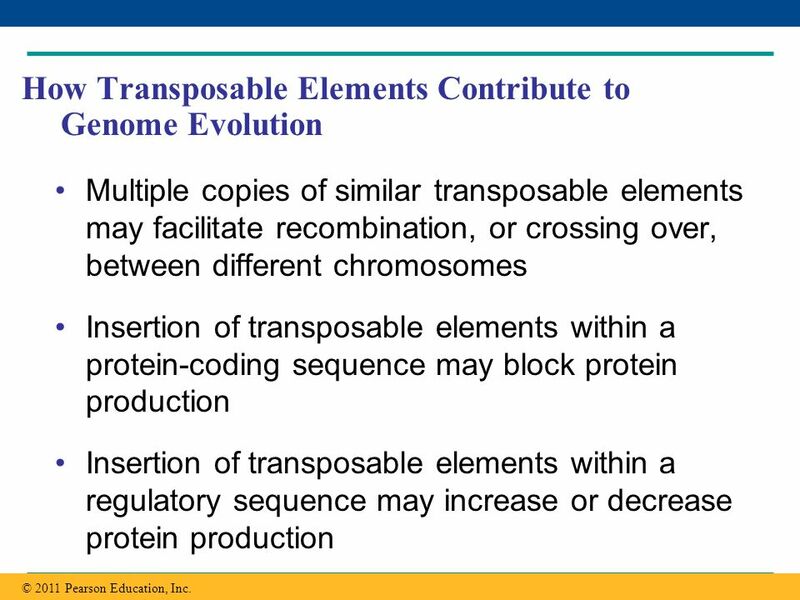 Copyright, ©, 2002, John Wiley & Sons, Inc.,Karp/CELL & MOLECULAR BIOLOGY 3E The Stability of the Genome Duplication, Deletion, Transposition. 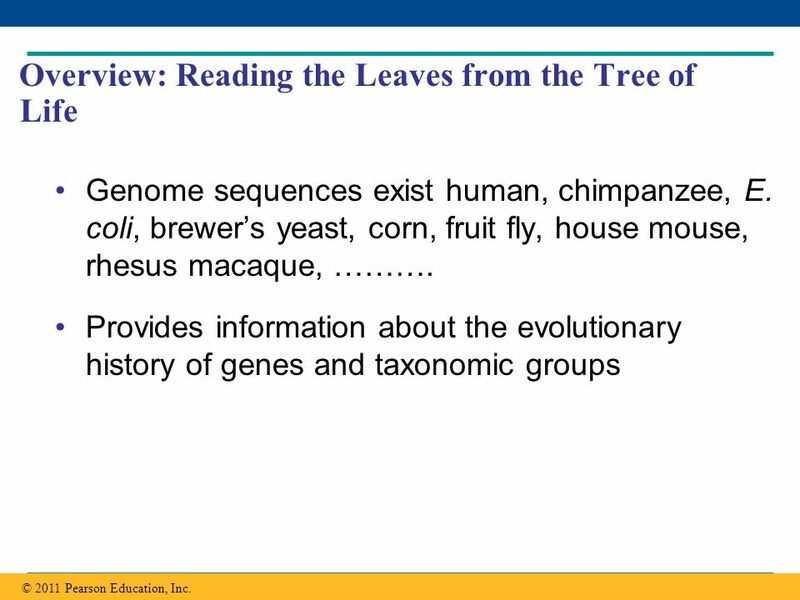 Copyright © 2008 Pearson Education, Inc., publishing as Pearson Benjamin Cummings PowerPoint ® Lecture Presentations for Biology Eighth Edition Neil Campbell. 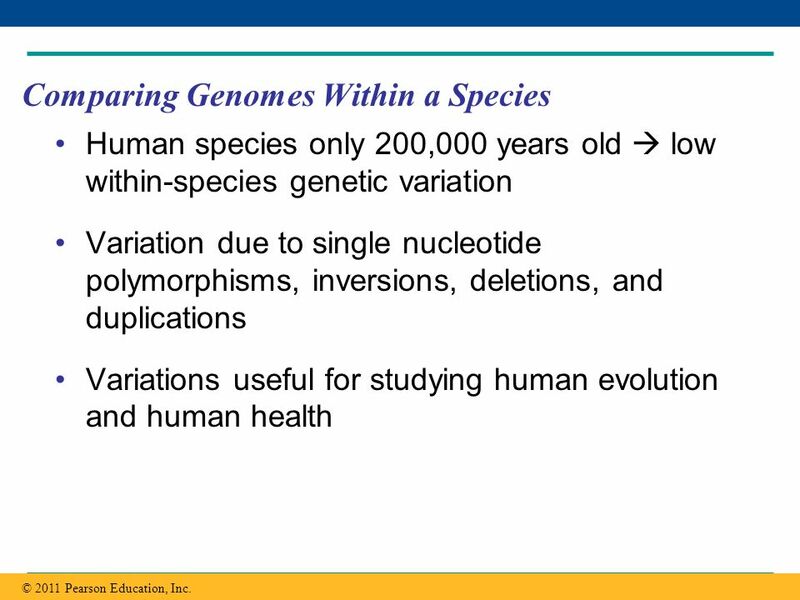 DNA Technology and Genomics. 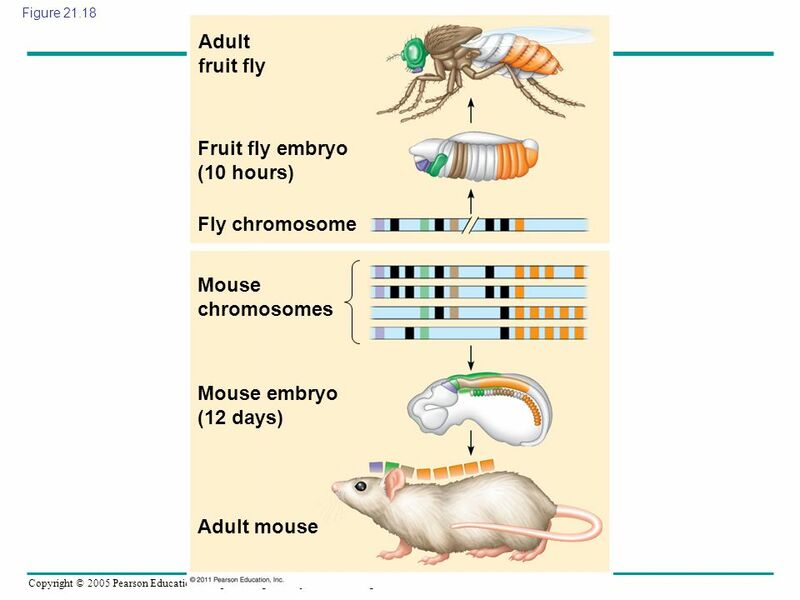 Recombinant DNA n Definition: DNA in which genes from 2 different sources are linked n Genetic engineering: direct manipulation. 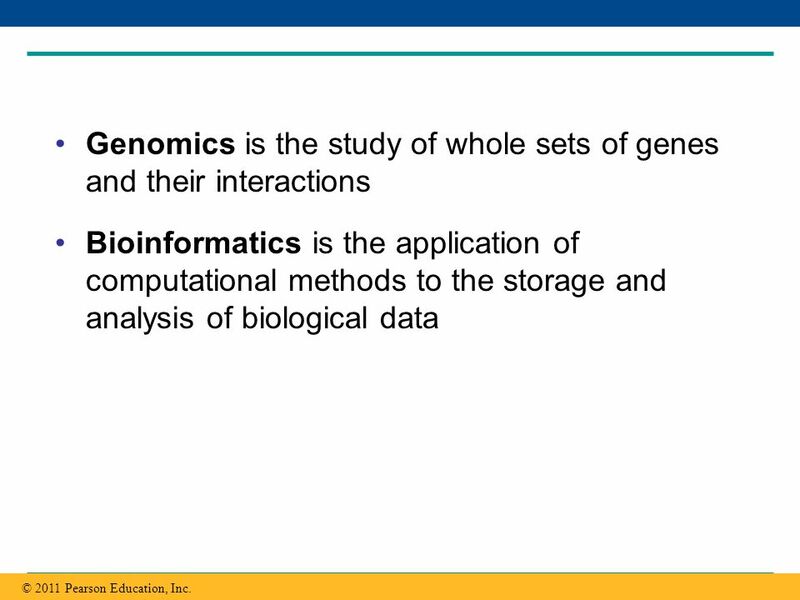 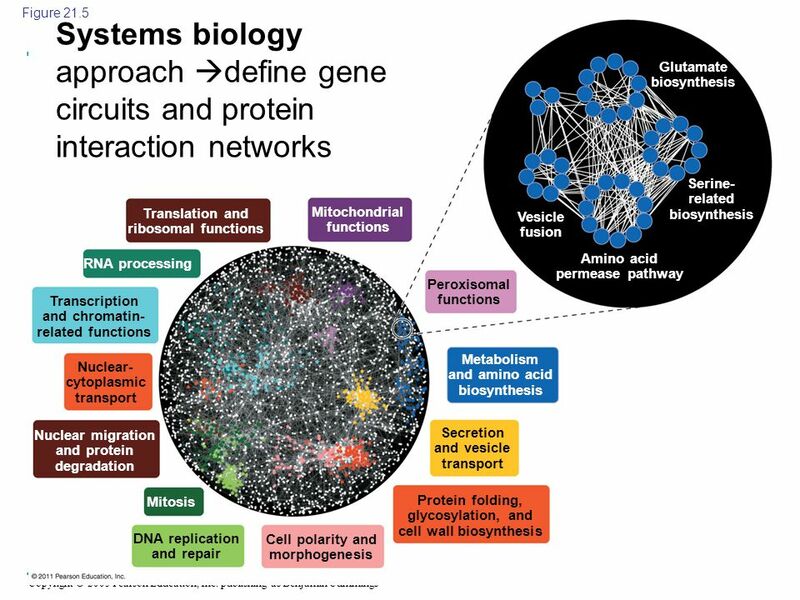 What is genomics? 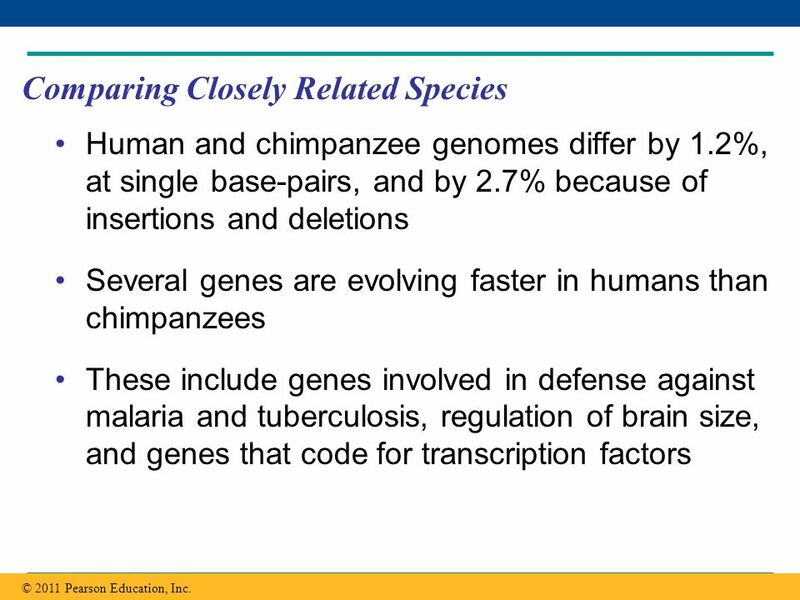 Study of genomes. 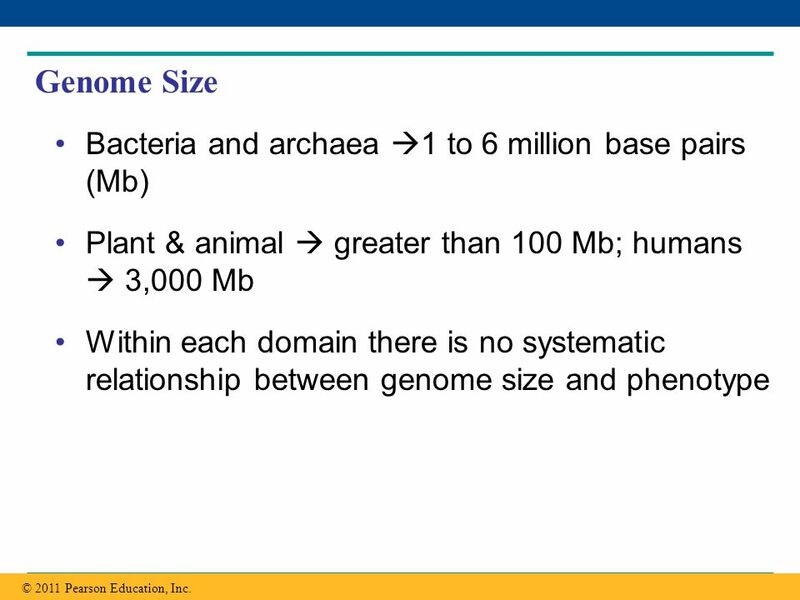 What is the genome? 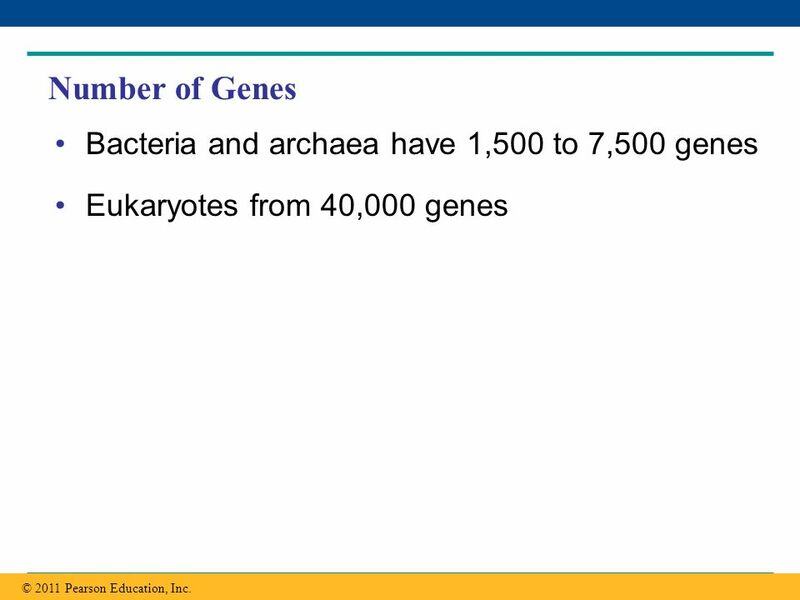 Entire genetic compliment of an organism. 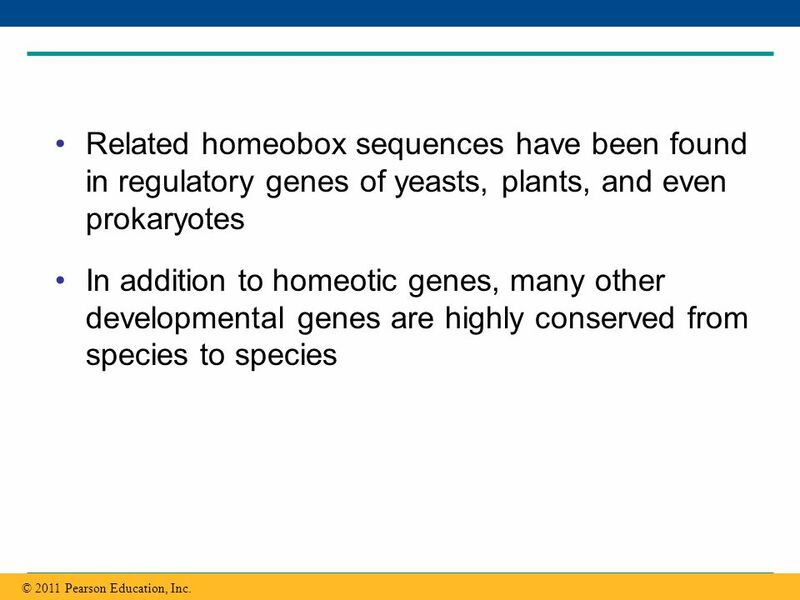 LECTURE PRESENTATIONS For CAMPBELL BIOLOGY, NINTH EDITION Jane B. Reece, Lisa A. Urry, Michael L. Cain, Steven A. Wasserman, Peter V. Minorsky, Robert. 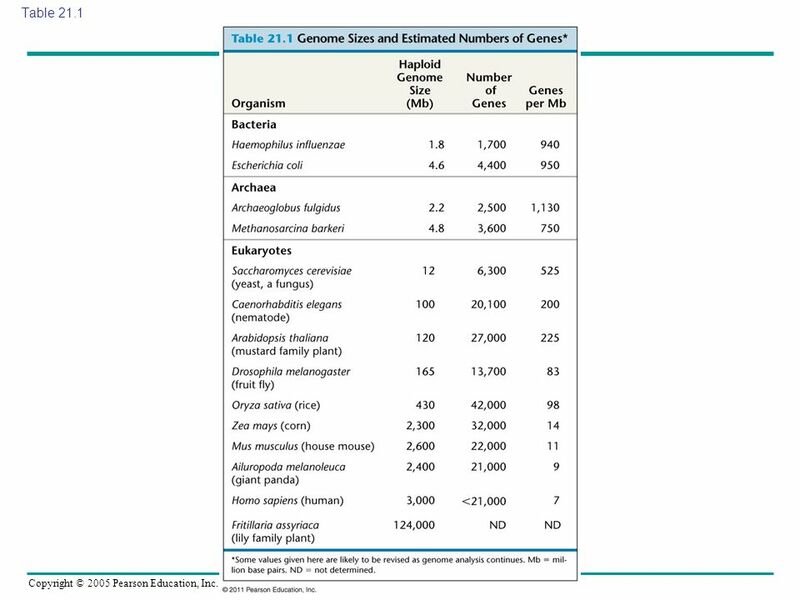 To talk about number of genes maybe we should revisit What is a gene?? 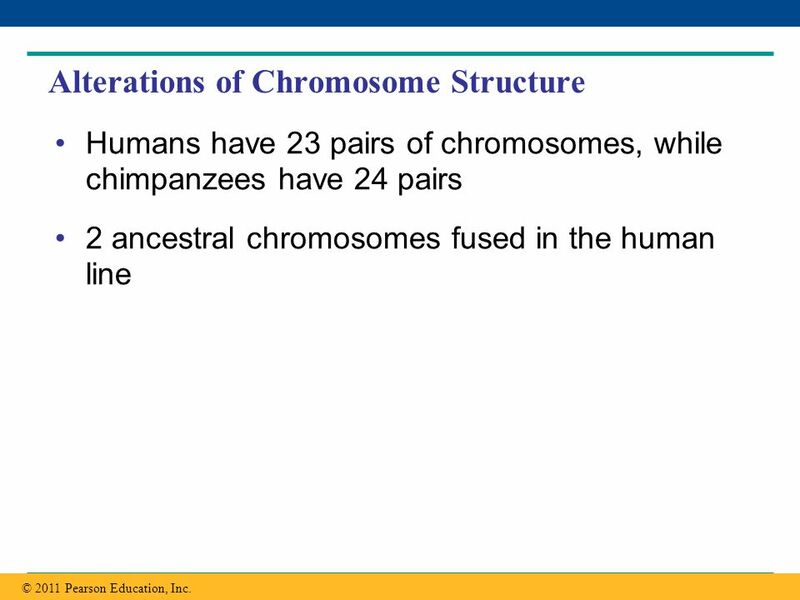 (p270 and p290 and this chapter) How about “a locus or place on a chromosome” Problem? 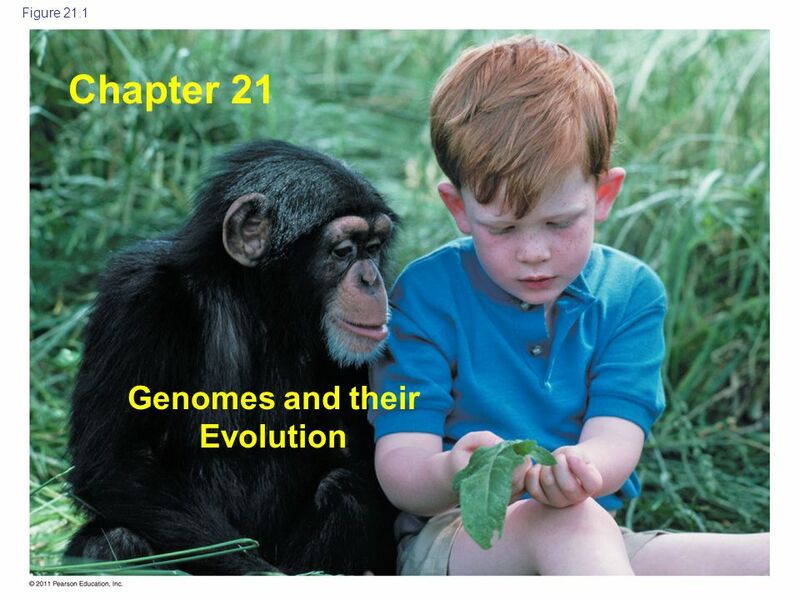 GenomesGenomes Chapter 21. 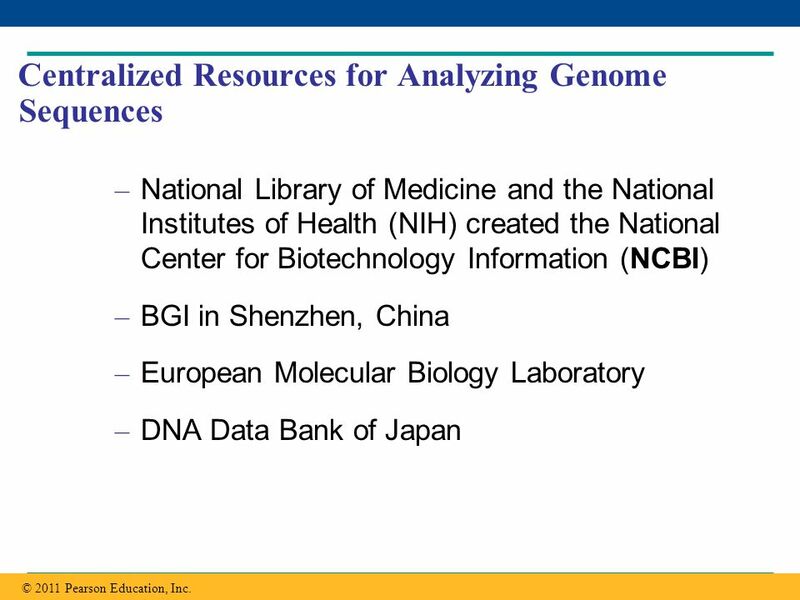 Genomes Sequencing of DNA Human Genome Project countries 20 research centers. 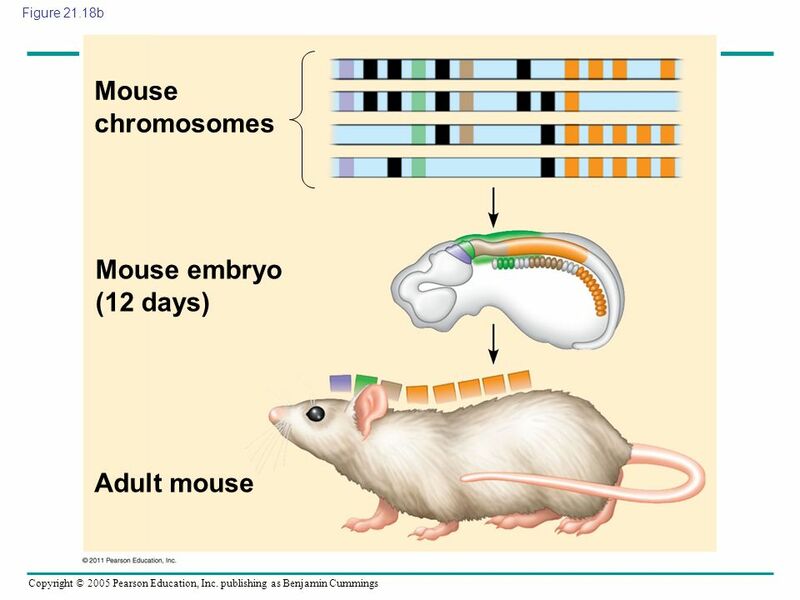 WHAT PRACTICAL USES HAS OUR KNOWLEDGE OF GENETICS PROVIDED? 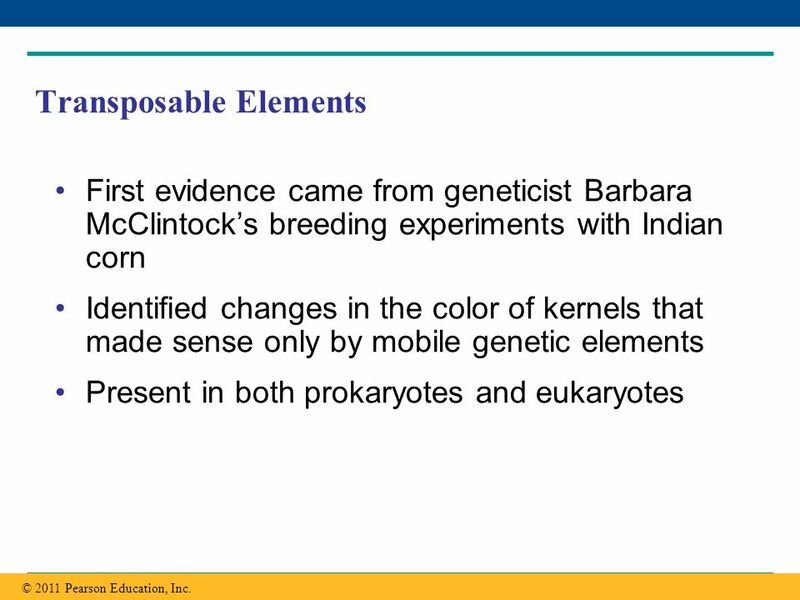 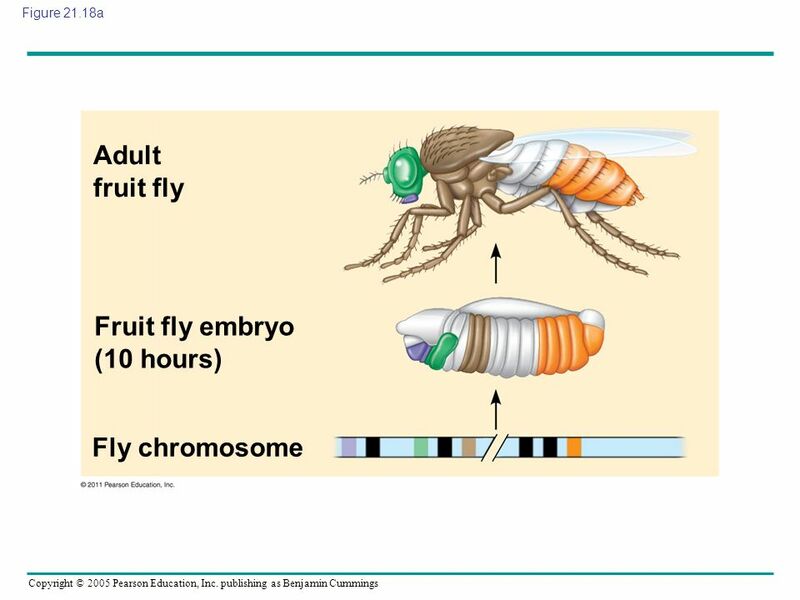 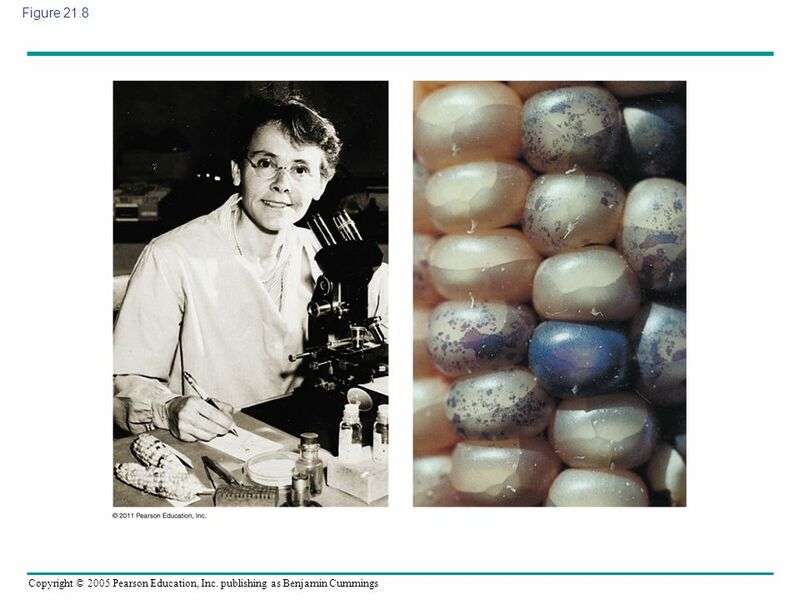 CAMPBELL BIOLOGY IN FOCUS © 2014 Pearson Education, Inc. Urry Cain Wasserman Minorsky Jackson Reece Lecture Presentations by Kathleen Fitzpatrick and Nicole.